Use your browser "back" key to return to this page from any image. 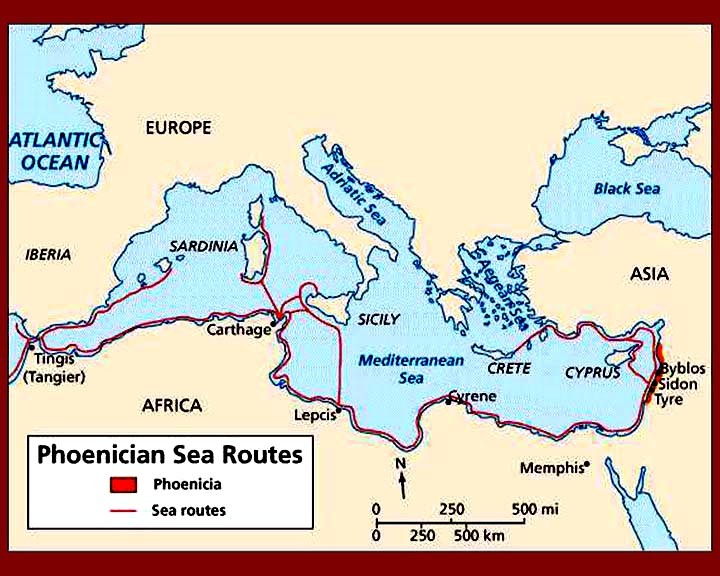 Phoenicians and Greeks were colonizing the Mediterranean for centuries before Rome rose to power. There were some important differences in their colonization strategies. The Greeks were disunited and city states were colonizing independently. 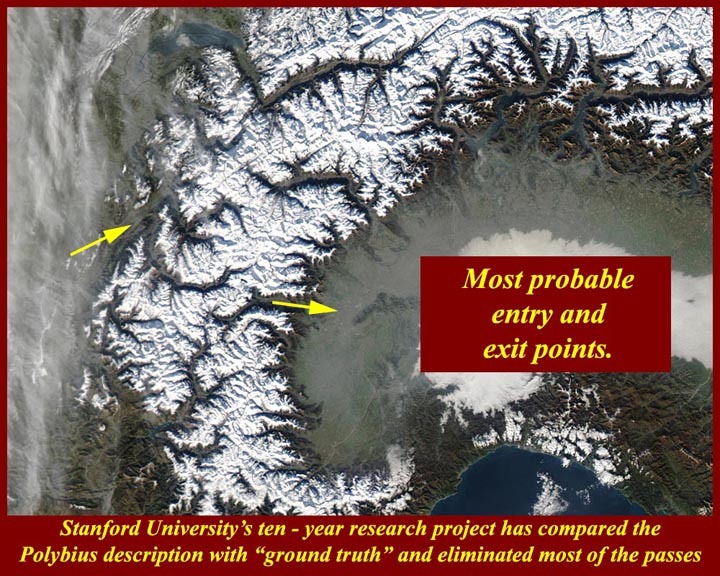 All were looking for places to settle excess (and sometimes dissident) population. The Greeks tended to colonize the islands, the northern side of the Mediterranean and the eastern part of North Africa. They wanted cities and hinterland for agricultural proposes. The Romans eventually called the Greek colonies of Italy and Sicily "Magna Graecia", and that could give the wrong impression of unity among the Greek colonies. They actually fought amongst themselves constantly -- just as the Greek city states who originally had sent out the colonists continued to fight amongst themselves. The only thing that might unite a group of Greek colonies was an outside threat; at one point the Greeks of Sicily united against the Phoenician/Carthaginian threat and threw their enemies off the island -- but only temporarily. The Phoenicians, on the other hand were looking for trade. They set up small urban colonies where Phoenician factors (i.e., tradesmen) could set up shop and sell finished goods to the interior, where they could buy raw materials and local handicrafts for the home market, and perhaps where they could either set up light industries or organize pre-existing light industries. Some Phoenician colonies, like Utica and Carthage (from northern Semitic, Kart Hadasht = new city; equivalent to the Greek Neapolis) grew into larger entrepots where goods were consolidated for shipment back to Phoenicia or Phoenician shipments were broken down for onward distribution to smaller colonies. 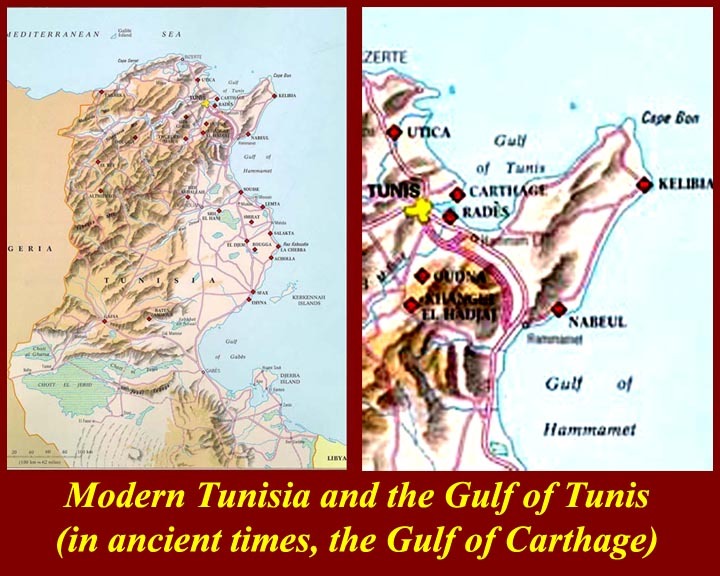 They were close neighbors on the Gulf of Tunis but had been set up by rival Phoenician trading cartels from Sidon and Tyre. Carthage always overshadowed Utica; several Tyrian trading families invested heavily in Carthage and had large trading organizations there. When the Phoenician homeland was conquered and divided into four client kingdoms in 539 BC by Cyrus the Great, Carthage became the leader of the "new Phoenicia" in the Western Mediterranean. Even in their largest colonies like Carthage, Phoenicians were always very thin on the ground in their settlements; they hired (and sometimes enslaved) locals to work for them and, eventually, to serve as land troops and mariners. The use of mercenary troops would eventually prove to be disadvantageous. Polybius is our main source of information on the Punic wars. 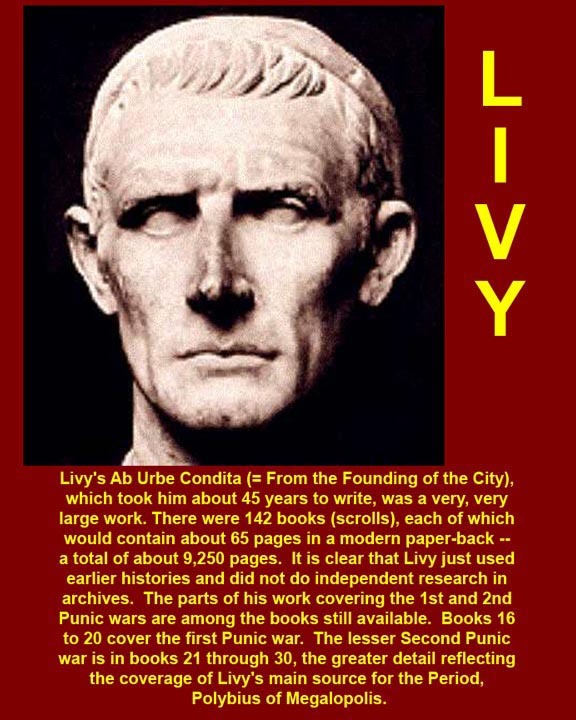 Livy used the works of Polybius as the basis of his writings on the Punic wars, but he obviously used other sources, now lost, as well. 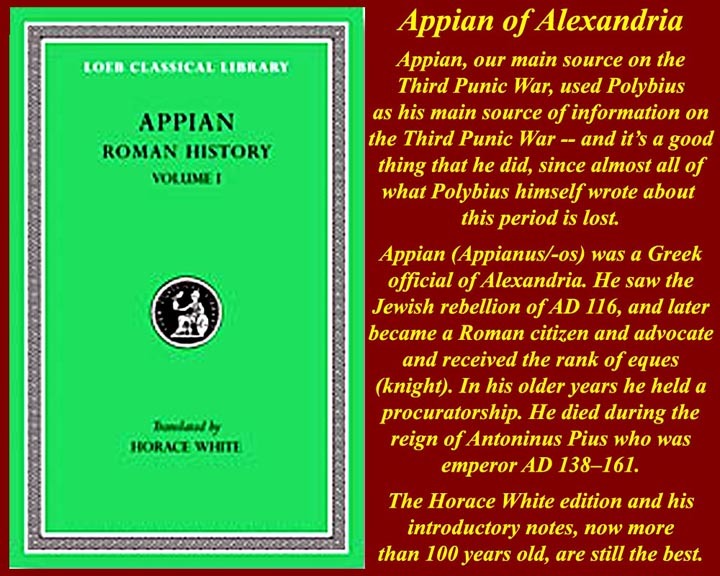 A third Historian, Appian of Alexandria, wrote in the 2nd century AD using Polybius as his source on the Third Punic War, and it's a good thing he did, because the volumes by Polybius about the Third Punic war have never been found. 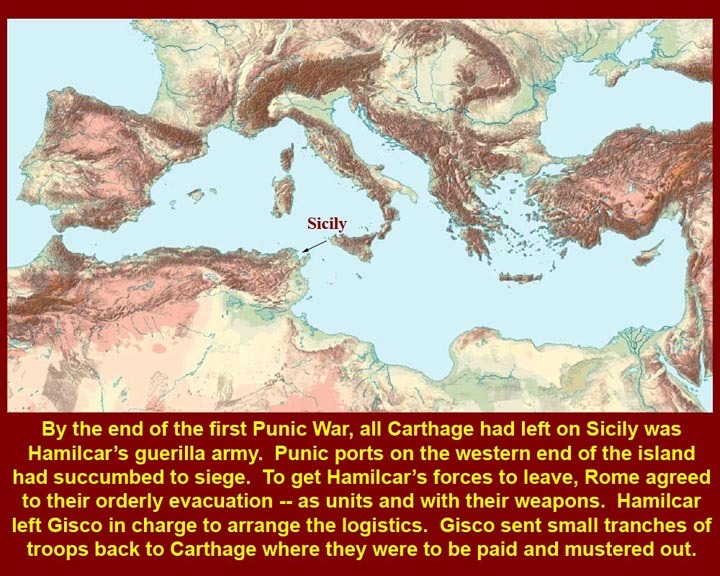 The Punic wars were initially concerned with shipping and particularly with shipping through the narrow passage between Carthage and Sicily. As Rome grew, it needed more food than if could produce in Italy, so shipping became critical for Rome's continued growth. 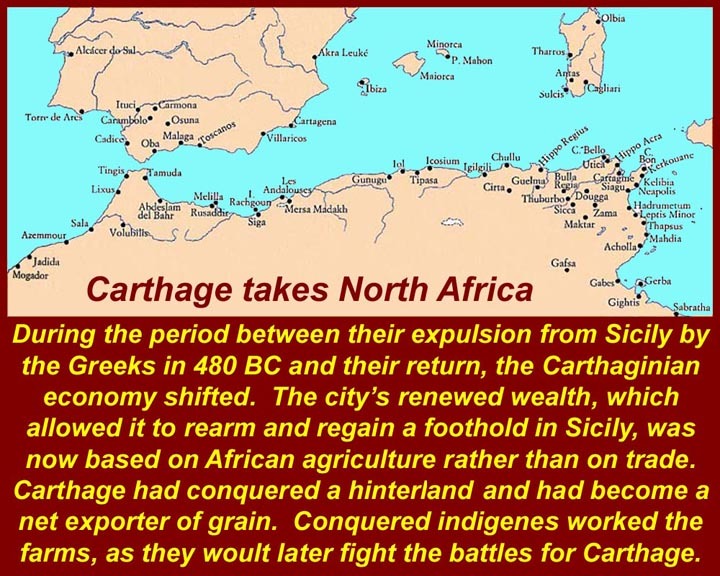 Carthage controlled the sea lanes, and, for a long time, the Romans participated in unequal treaties with the Carthaginians -- Rome paid the Carthaginians to let Rome trade. Ships, of course were essential. 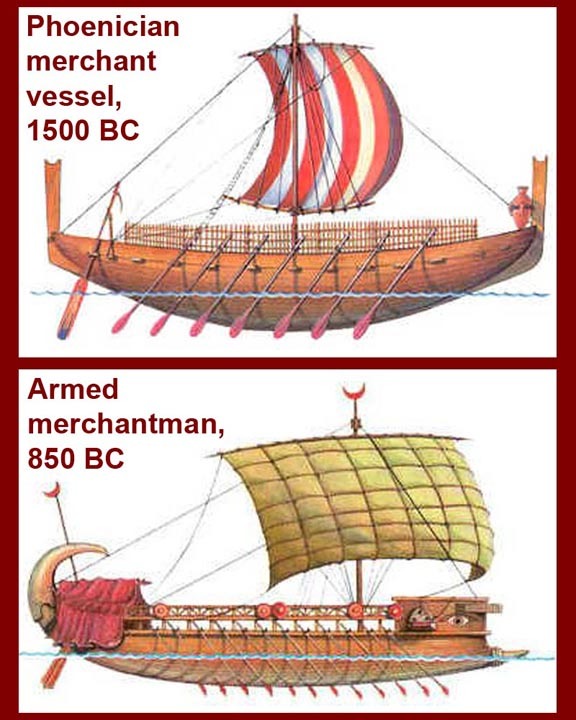 Rome had cargo ships, but very few fighting ships. 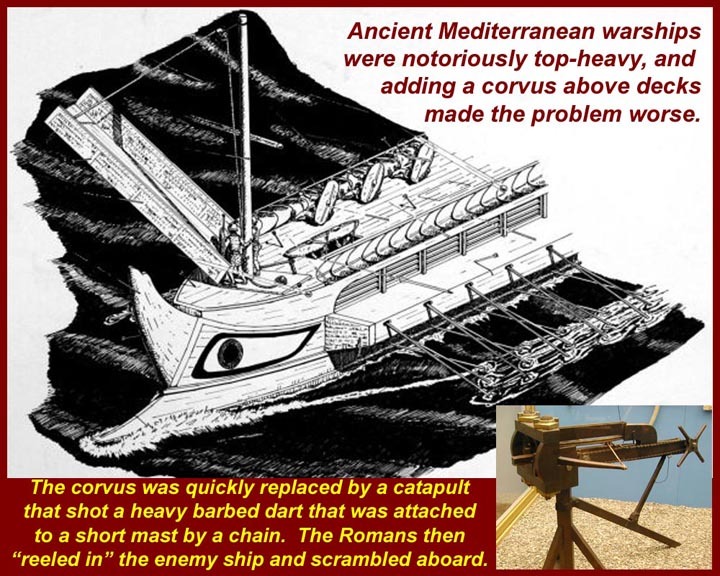 Meanwhile Carthage was mass producing warships. 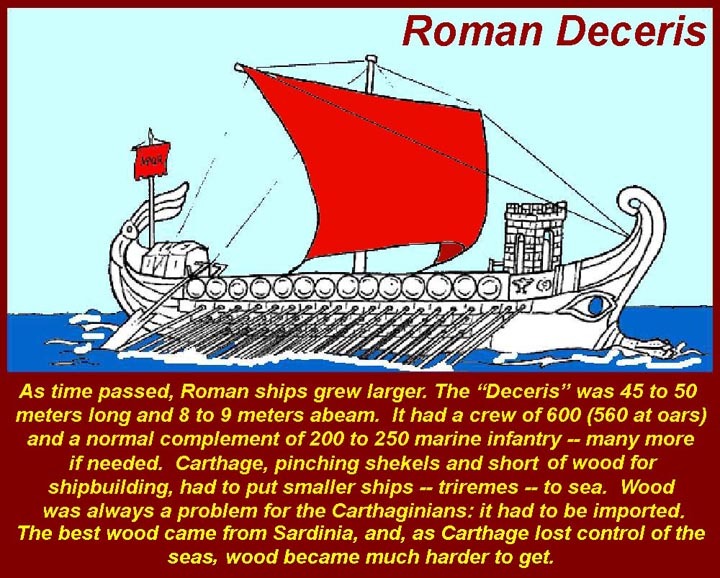 And that's not an exaggeration either about numbers or about shipbuilding methods; Carthaginian warships were built up of standard interchangeable parts. 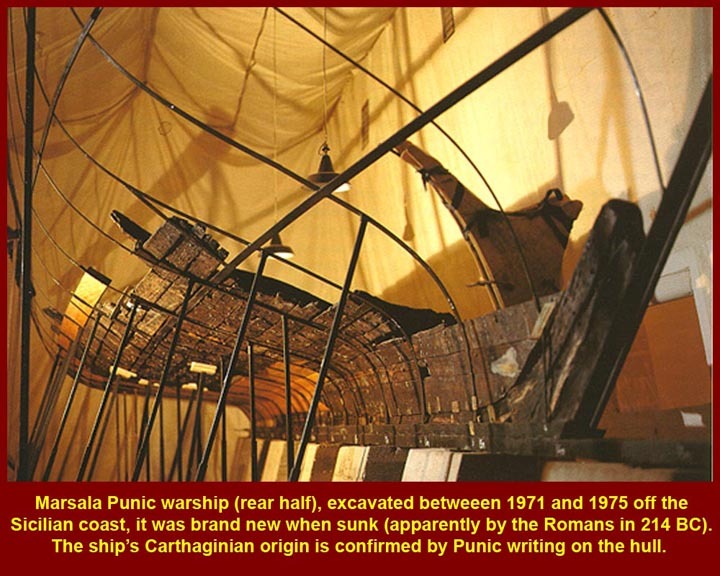 We know this not only from contemporary accounts, but also from recovered Carthaginian ships like the half of a Carthaginian ship shown in (c), above, that was recovered off the coast of Marsala at the western tip of Sicily; it was brand new when it was sunk by the Romans, and it still retains marks giving assembly instructions ("tab a into slot b", etc.) Other recovered ships had identical parts. But the ancient Romans were excellent copyists and craftsmen. According to contemporary accounts, they recovered a Carthaginian warship that wrecked on the instep of the Italian boot and quickly were building "Carthaginian class" warships. According to Greek and Roman legend, Carthage was founded by princess Elissa (perhaps "Elishat" in Phoenician). 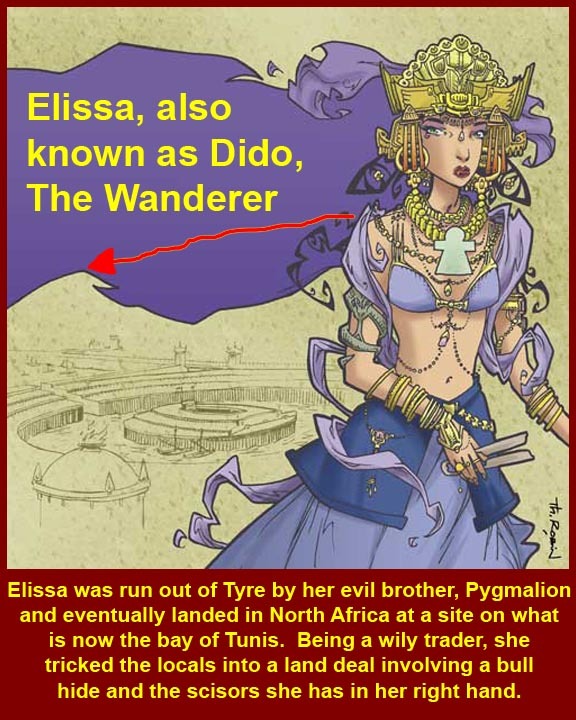 She is also known as Dido, which means "Wanderer". The only full account of the founding of Carthage that survives before Vergil's treatment is that of Vergil's contemporary Gnaeus Pompeius Trogus in his Philippic histories as rendered in a digest or epitome made by Justin two hundred years later. According to Justin (18.4–6), a king of Tyre, whom Justin does not name, made his very beautiful daughter Elissa and son Pygmalion his joint heirs. But on his death the people took Pygmalion alone as their ruler though Pygmalion was yet still a boy. 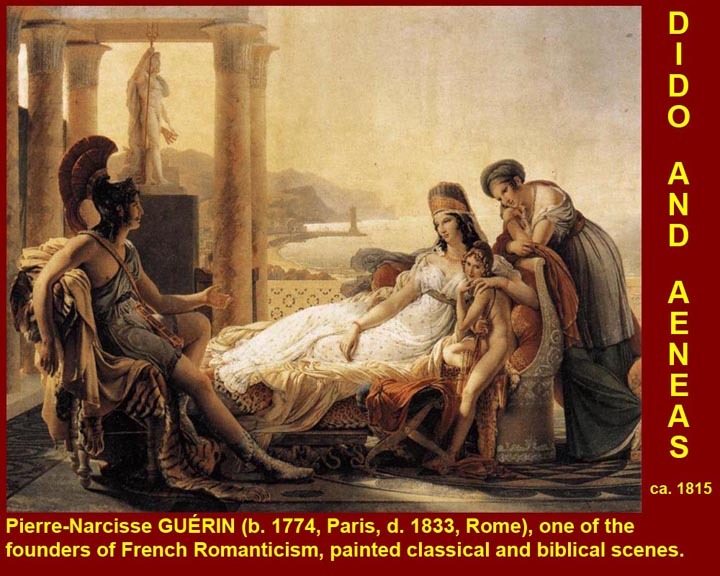 Elissa married Acerbas her uncle, who as priest of Hercules (that is, Melqart) was second in power to King Pygmalion. Rumor truthfully told how Acerbas had much wealth secretly buried, and King Pygmalion had Acerbas murdered in hopes of gaining the wealth. Elissa, desiring to escape Tyre, pretended to wish to move into Pygmalion's palace. But then Elissa ordered the attendants whom Pygmalion sent to aid in the move to throw all Acerbas' bags of gold into the sea as an offering to his spirit, or so it seemed. In fact the bags contained only sand. Then Elissa persuaded the attendants to join her in flight to another land rather than face Pygmalion's anger when he discovered what had supposedly become of Acerbas' wealth. Some "senators" also joined her. The party arrived at Cyprus where the priest of Jupiter joined the expedition. There the exiles also seized about 80 young women who were prostituting themselves on the shore in order to provide wives for the men in the party. 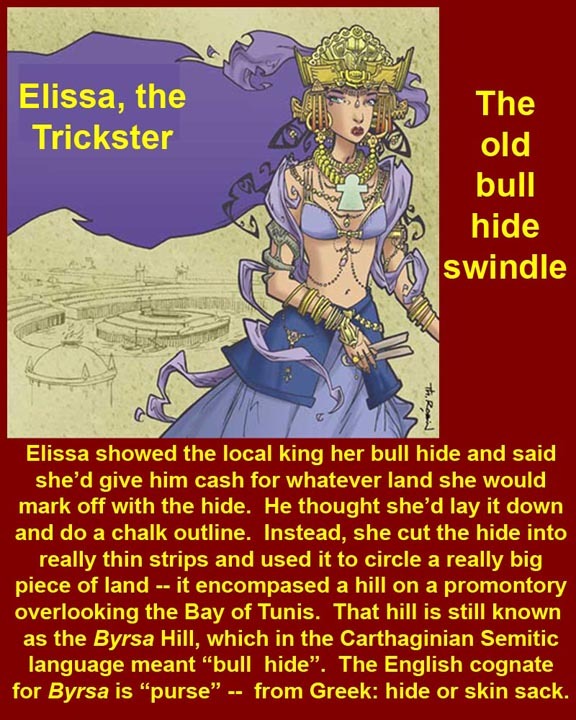 Eventually Elissa and her followers arrived in Libya where Elissa asked the local inhabitants for a small bit of land for a temporary refuge until she could continue her journeying, only as much land as could be encompassed by an oxhide. They agreed. 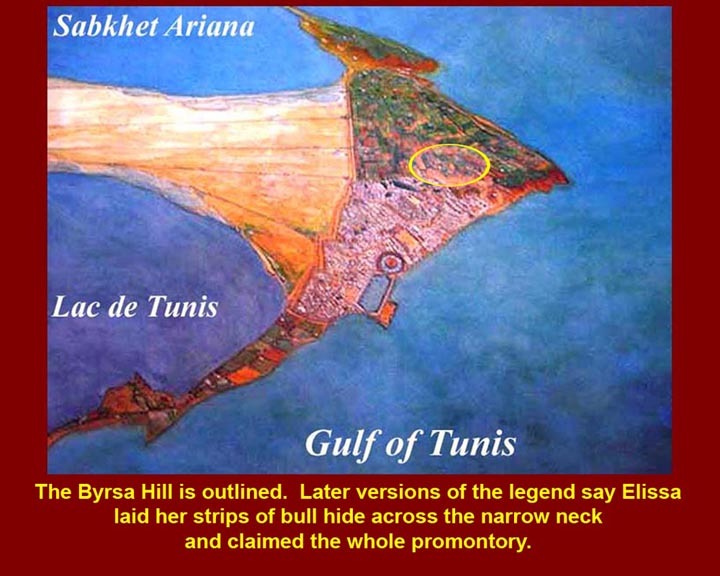 Elissa cut the oxhide into fine strips so that she had enough to use it to surround an entire nearby hill, which was therefore afterwards named Byrsa 'hide'. That would become their new home. Many of the locals joined the settlement and both locals and envoys from the nearby Phoenician city of Utica urged the building of a city. In digging the foundations an ox's head was found, indicating a city that would be wealthy but subject to others. Accordingly another area of the hill was dug instead where a horse's head was found, indicating that the city would be powerful in war. 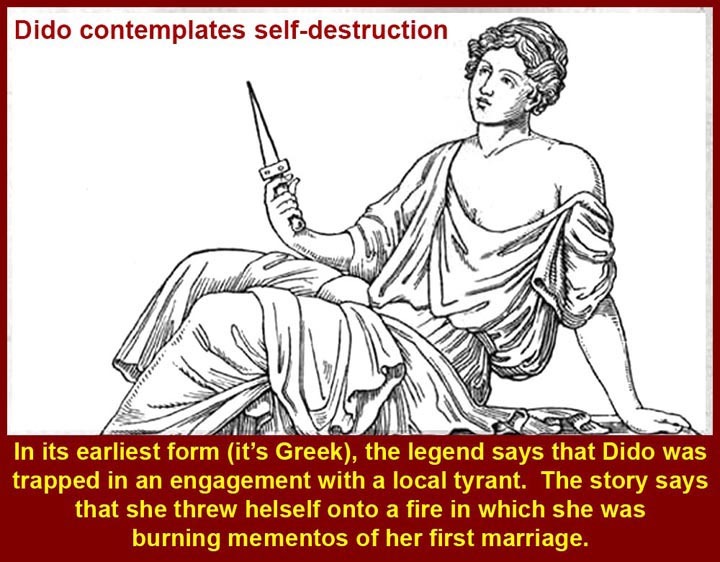 An early Greek form of the Dido legend has her forced into an unhappy marriage with a north African prince. She asks to burn all the mementos of her first marriage, and, when the fire is going nicely, hops in. Vergil changes that to a happy tryst with Aeneas that ends when he runs off to fulfill his Italian destiny. After he leaves, and having borne his child, she leaps int the fire where she is burning mementos of their affair. The child, therefore, hates Rome, and the Punic Wars are the eventual result. 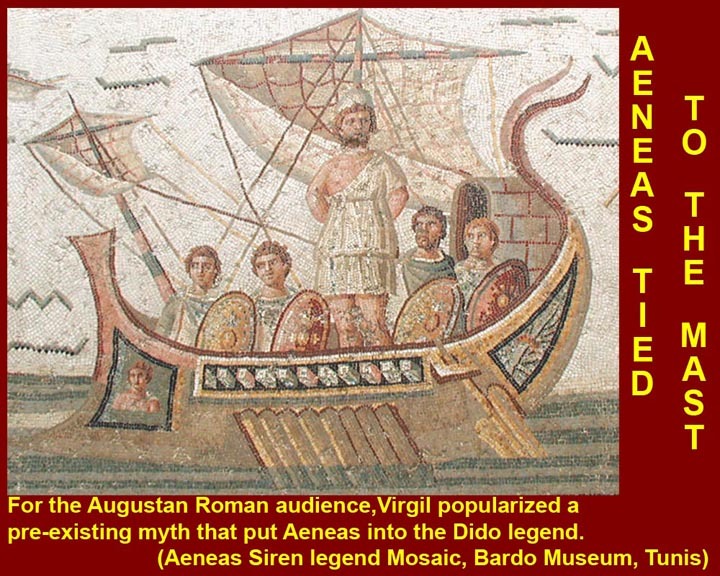 During the Roman period in North Africa, the Aeneas legends were very popular decorative motifs. This mosaic from a Roman villa near Carthage confounds the Aeneas and Odysseus legends. Whoever it is, he's tied to the ship's mast to hear the song while his crew, their ears stopped with wax, rows on. 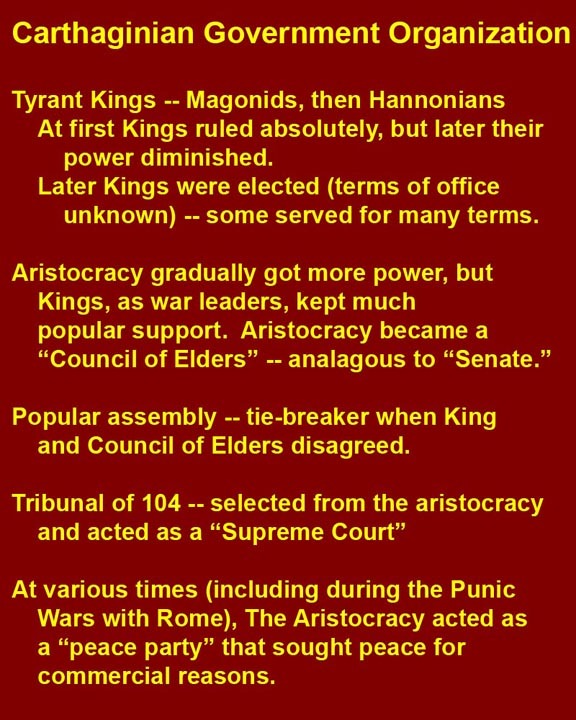 There was constant tension between the aristocracy, who wanted peace, almost at any price, so they could get back to commerce, and the "Kings" (only an approximate translation), each of whom was the commander-in-chief of Carthaginian forces. It appears that sometimes (as it also sometimes happens today) parts of the military establishment acted independently and with no regard to the wishes of the civilian government. This also, by the way, seems to have happened at times in Rome. Not much of Punic Carthage is left. The Romans leveled the city at the end of the Punic Wars, and, starting during the reign of Augustus, built a new Roman Carthage on the same spot. The Romans went to a great deal of effort to wipe out (and eventually replace) all the Carthaginian towns. 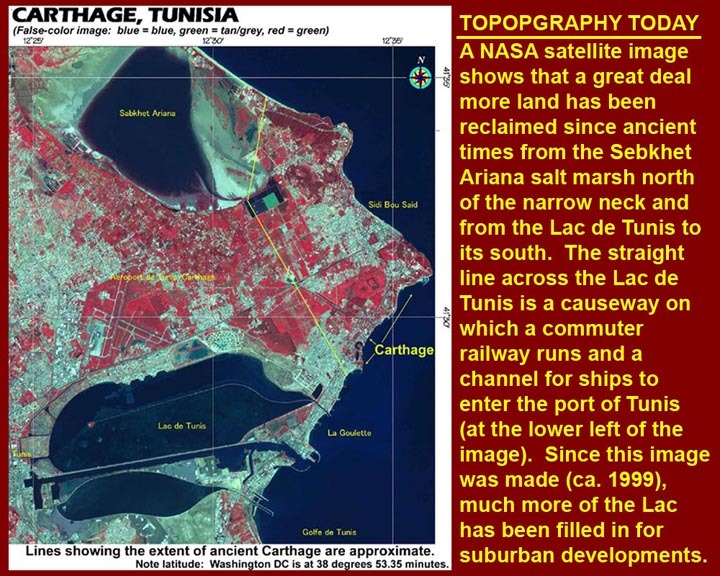 One that they apparently missed was near the place now occupied by the Tunisian city of Kerkouane on the east side of the Cap Bon peninsula. 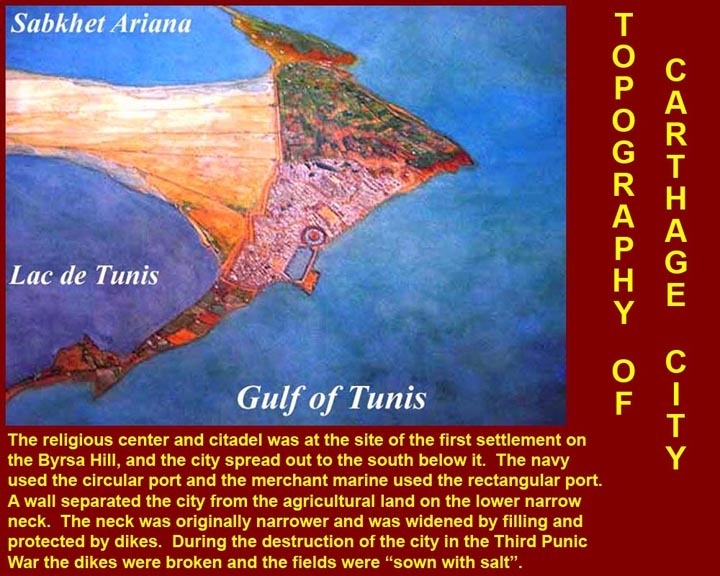 (Cap Bon was the French colonial name for the Bay of Tunis.) So we do have some identifiable Punic urban ruins that can be studied. 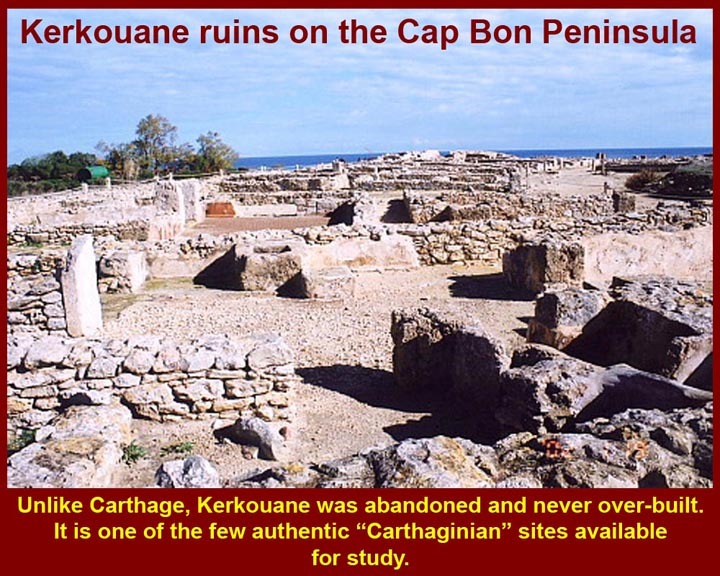 The ruins near Kerkouane include Punic houses. 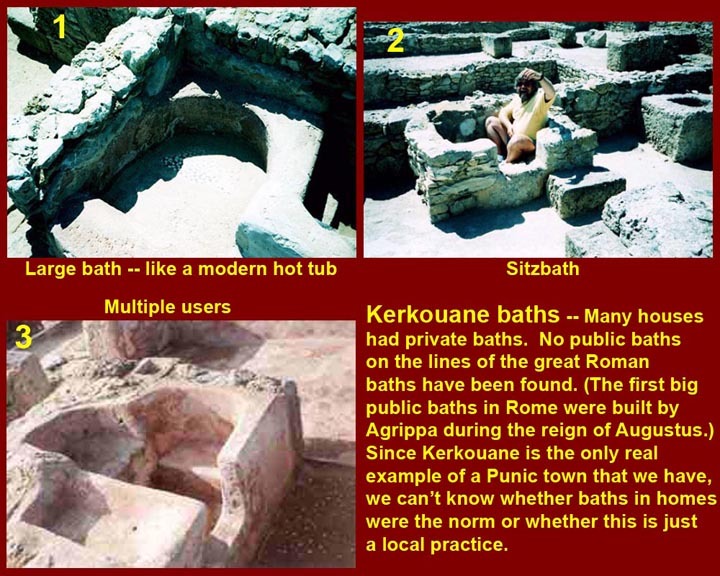 While the Romans bathed in groups, the Punic population of this city appear to have wanted their privacy. 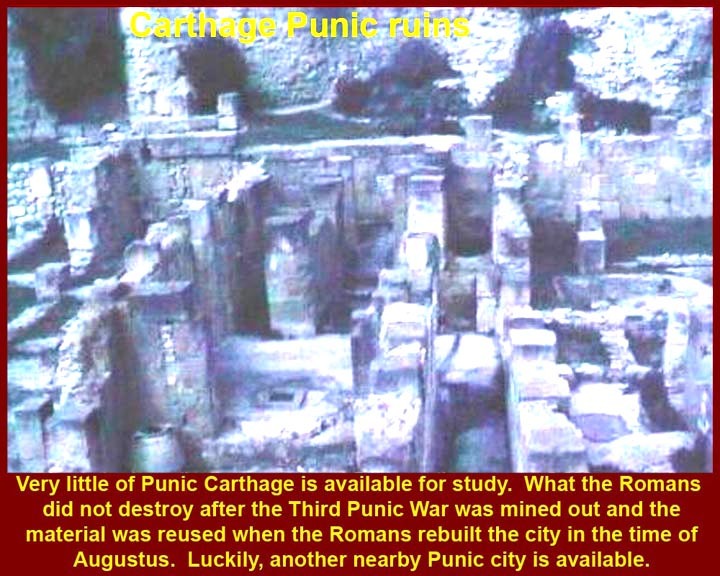 FYI: I have adopted the conventional form of referring to the population of the Carthage urban area as Carthaginian and the other Semitic population as Punic -- that's what the ancient Romans did, too, thence the "Punic" Wars. Most of the population of the areas under Carthaginian dominance were either "Numidians", i.e., dessert tribesmen, or "Libyan", i.e. the indigenous coastal population, so named by the Greeks and so called by the Romans. 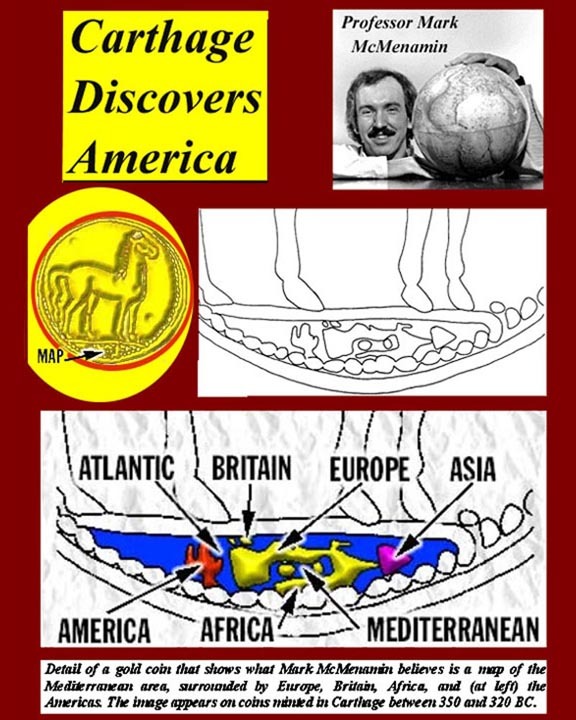 Did Carthage discover America? Here's a scientist who thinks it might be so. The strategic situation in the western Mediterranean developed in such a way that eventually there were only two powers left -- and both of them had become accustomed to expansion. When their interests impinged upon each other, there was bound to be conflict. 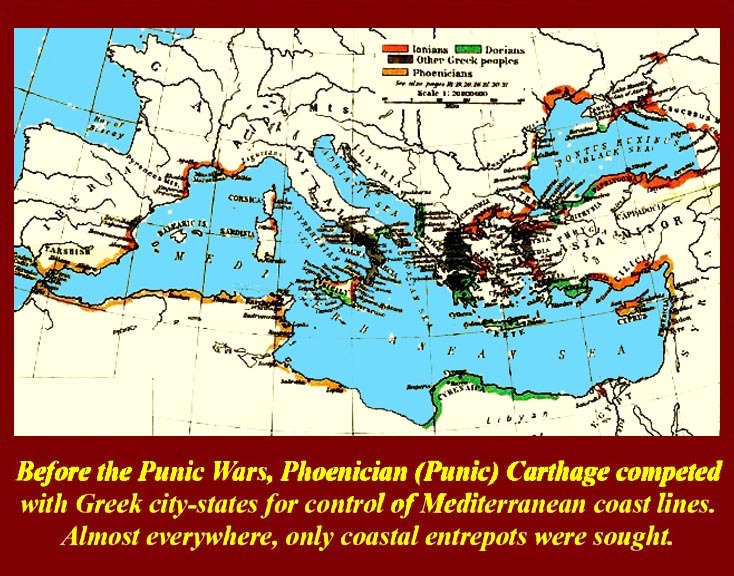 After Cyrus captured Phoenicia, Carthage became the metropolis of the Punic territories. 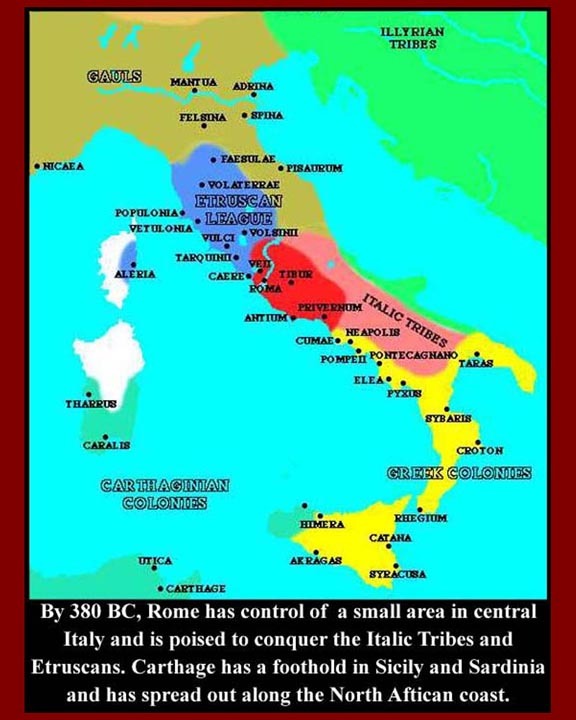 It conquered the other Punic settlements and took over the coastal agricultural areas. North Africa became an exporter of grain and other agricultural products. 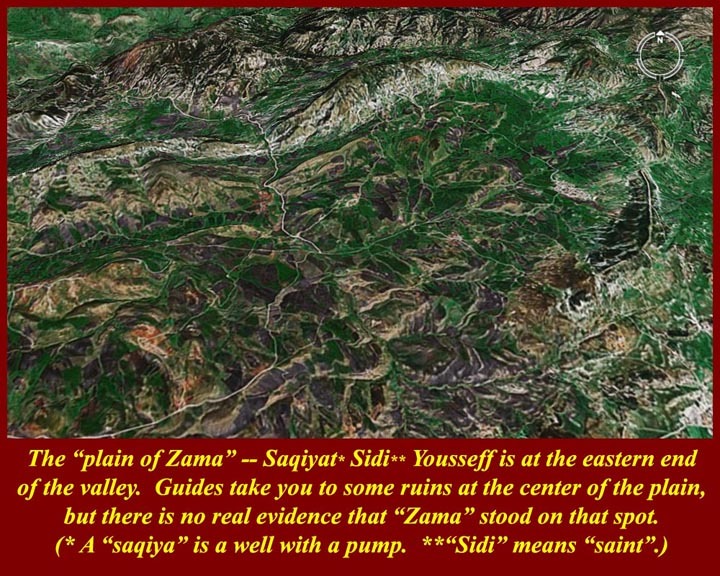 That fact attracted the avaricious attention of Roman agribusiness moguls. As noted before, there were both Greek and Punic colonies on Sicily. 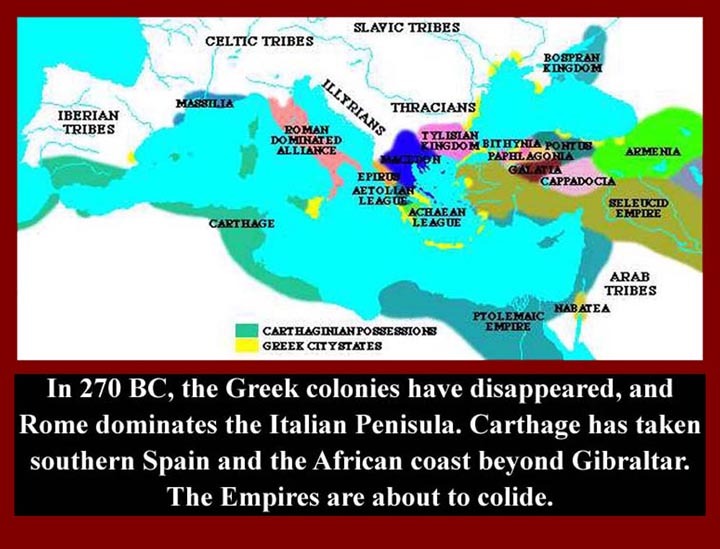 When Carthage took over the "empire" in North Africa it also accepted protective responsibility for the Sicilian Punic colonies (and for the ones on Corsica and Sardinia -- where Carthage got its wood for shipbuilding. The Greek colonies on the island were constantly fighting with their neighbors, whether Greek of Punic, and Carthage did not hesitate to intervene. 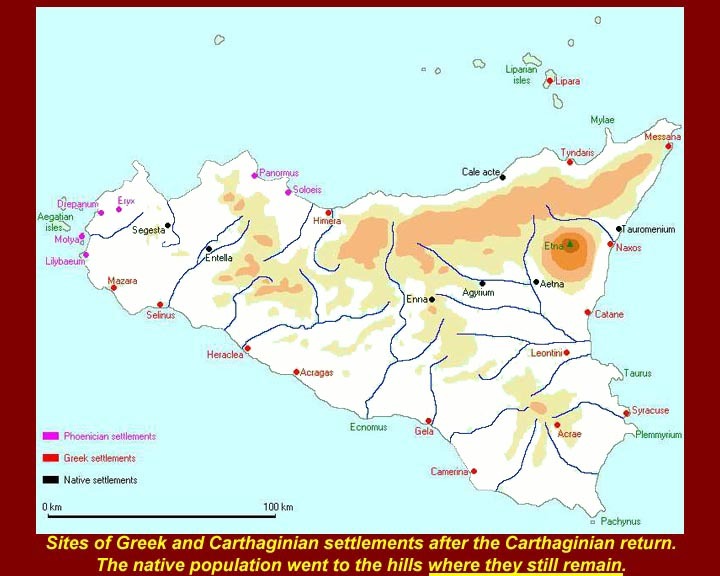 In fact, Carthage relished the opportunity; its own agribusiness moguls had seen the good crop land on Sicily. We now, once again get into some murky circumstances -- we only have the Roman side if the story. 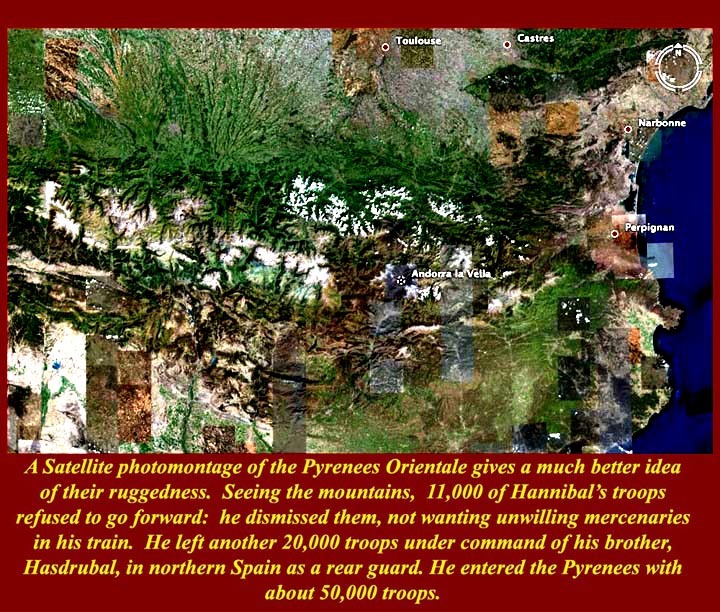 We will jump past the Pyrrhic wars in which the Romans and Carthaginians (but not necessarily in concert) depleted the forces of Pyrrhus of Epiros, who had been called in to protect some Greek colonies on the eastern end of Sicily. Suffice it to say that Roman forces were now in control of all of Southern Italy and that the toe of the boot is only two miles from the east coast of Sicily. The small time Greek king of Sicilian Syracuse had hired some Campanian mercenaries in one of his local wars, and when he died they were demobilized. The mercenaries called themselves Mamertines (i.e., "Martians" = adherents to Mars = Mamer in the Campanian dialect, the god of war). 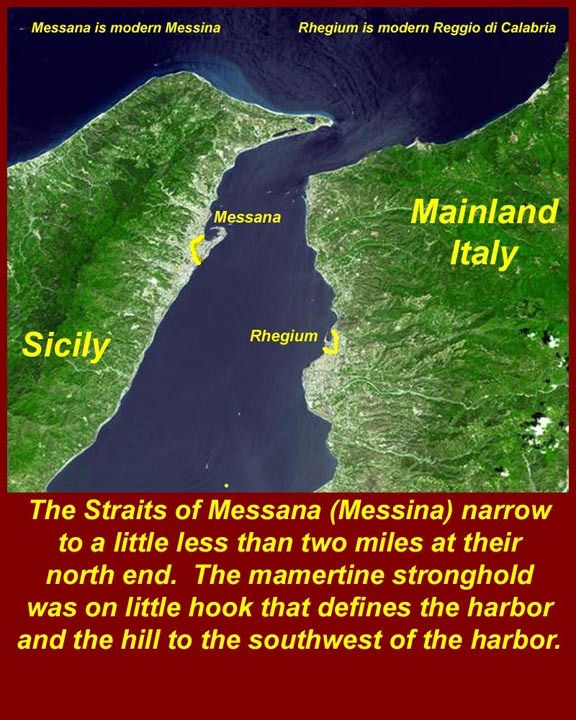 Instead of going back to the Campania (in Roman territory, near Naples), they took over the Greek town of Messana (today Messina) just two miles across the Straights of Messina from Italy. The local folks of Messana pushed the mercenaries onto a small hook of land on one side of the harbor and onto a hill behind the hook, but they could not force them out of that stronghold. Meanwhile the Mamertines were raiding Syracusan territory and indulging in a bit of piracy in the straights. That meant that the Messana port was unusable by the Greeks of the town. They had to get help or face ruin. 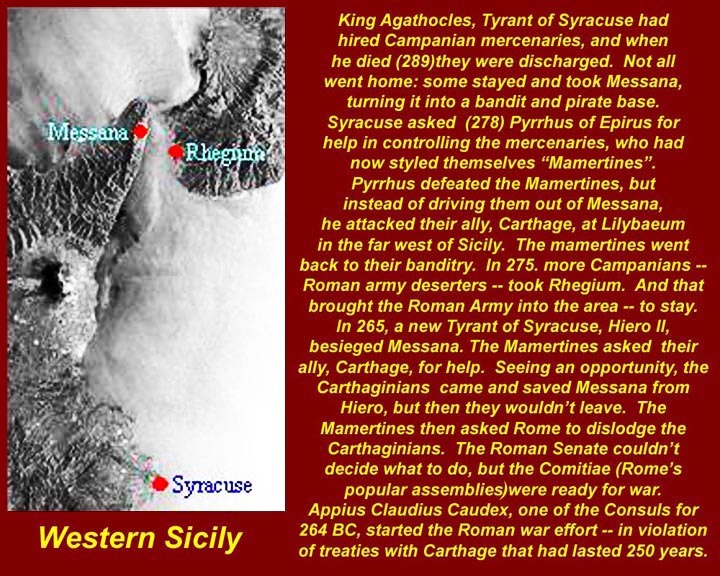 Some Syracusans and Messanese asked Carthage to intervene on their behalf, and Carthage responded positively, garrisoning the rest of Messana and skirmishing with the Mamertines. The Mamertines asked the local Roman commander in Rhegium for support, and a Roman force was ashore in Messana within hours. Rome was at war with Carthage. The First Punic War began that quickly. It's easy to surmise that the whole sequence of events was planned at least by the local Roman commander in Rhegium and maybe higher up the chain of command. The Roman forces were certainly ready to move onto Sicily at a moment's notice. A quick scorecard of the Punic Wars. 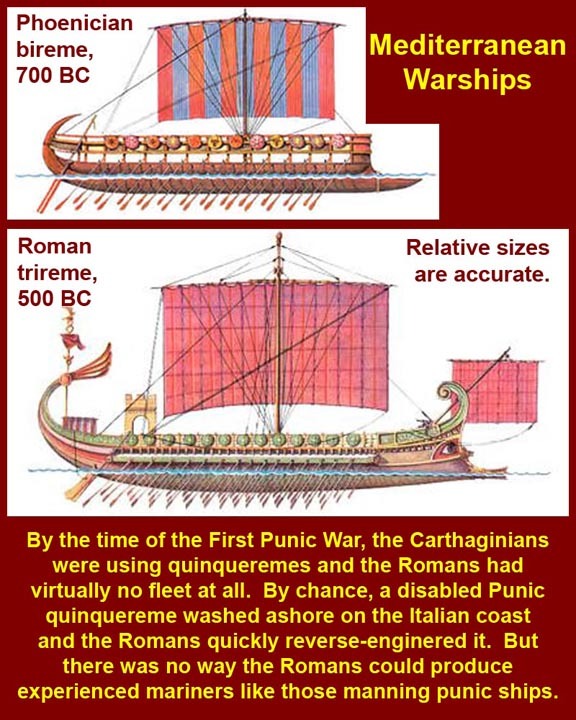 The quinquereme was the capital warship of both the Carthaginian and the Roman navies -- and there was nothing in any other Mediterranean navy to match them. The Romans knew nothing about "modern" naval architecture at the start of the war and knew even less about how to man ships. But the Romans were fast learners and copiers. 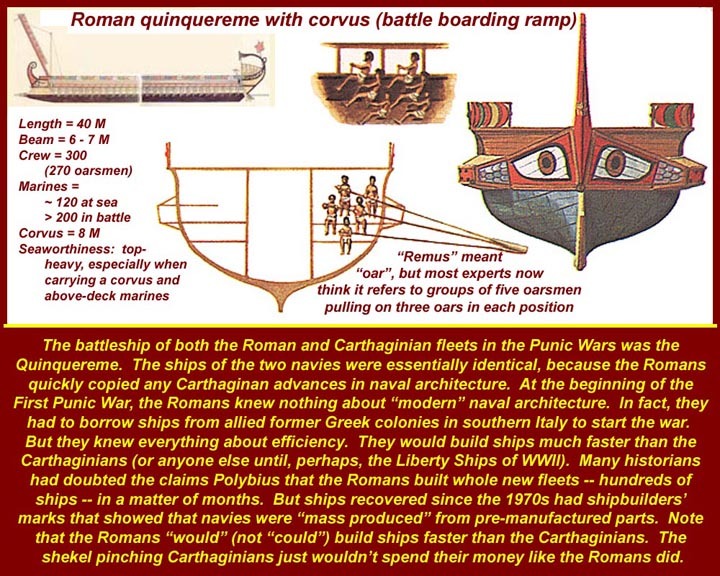 Initially they bought "borrowed" ships and impressed crews from former Greek ports on the Italian mainland, but the Romans were soon building huge fleets of quinquerimes at a much faster rate than the Carthaginians would match. That's "would", not "could". Rome was willing to spend, but the shekel-pinching Carthaginian aristocracy held back. Historians once doubted the Polybian claims of the many hundreds of ships built by the Romans -- needed because the Romans lost whole fleets in early naval battles and even more due to inexperienced officers who would steer into any storm that was available. But finds of sunken Roman warships of the period indicate that Rome very rapidly started to mass produce ships with identical and interchangeable prefabricated parts -- tab a into slot b. The rapidly expanding Roman navy also mass produced interchangeable "prefabricated" crews -- efficiently trained in land-bound mockups before being put aboard newly commissioned ships. 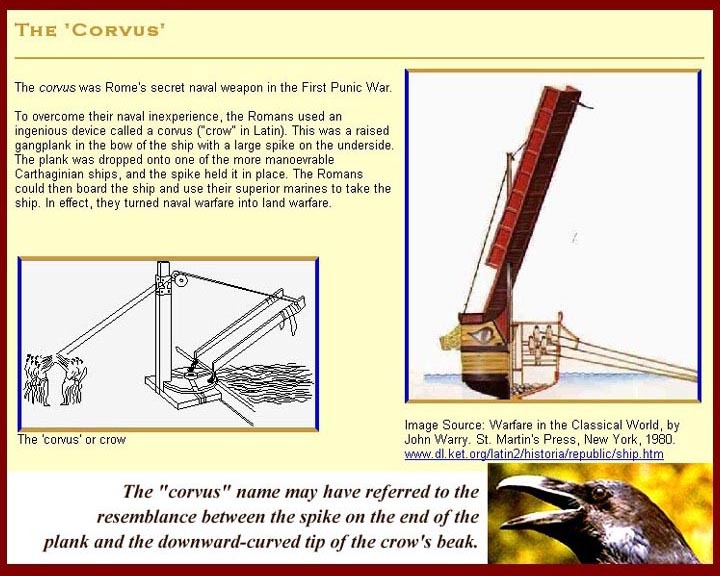 The corvus ramp often is credited with turning around Roman naval fortunes in the First Punic War. It allowed Roman marines (really just detachments of land soldiers) to swarm aboard Carthaginian ships and fight as if they were on land. There was little defense against this tactic, but the corvus made already unstable shallow draft ships even more wobbly. A new tactic was soon found; catapults shot heavy grappling darts, enemy hulls were reeled in, and the marines scrambled over to do their bloody work. The Romans never liked to ram enemies. The heavy bronze rostrum (ram) on the ship's bow was designed for quick disengagement, but there was always the chance of getting stuck and going down with the enemy ship. Besides that, Romans would rather capture and re-use enemy ships than sink them. Even if you did have to scuttle the enemy craft, you would want to bring home the rostrum of the enemy ship either as a trophy or because it was the most expensive part of a ship. 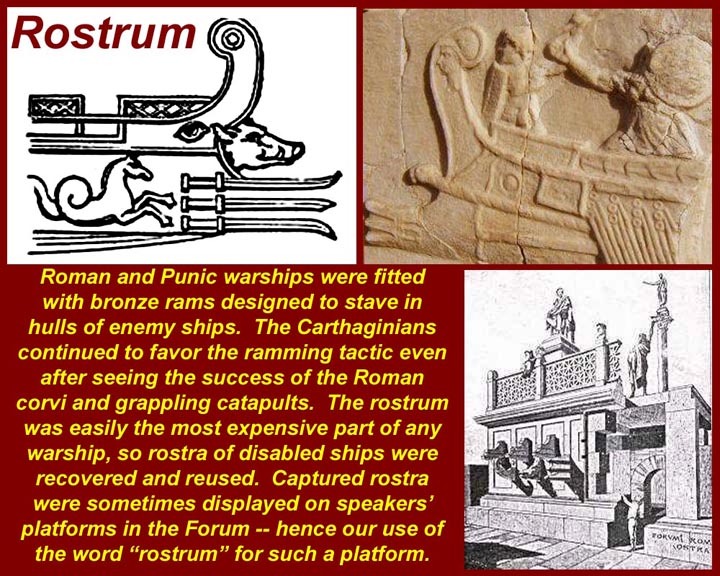 When Rome was in full ship-building fettle, the bronze rostrum was probably more costly than all the rest of the ship. It was also much more efficient to recycle rostra than to make them new. Roman naval engineers became quite imaginative. They built tall siege towers on catamarans and soon were producing dreadnought battleships 165 feet long, 35 feet wide, and carrying 600 crew and up to that many marines. They, of course, also carried siege towers that could literally tower over defensive bastions of Punic port towns. The land war on Sicily was won at sea. 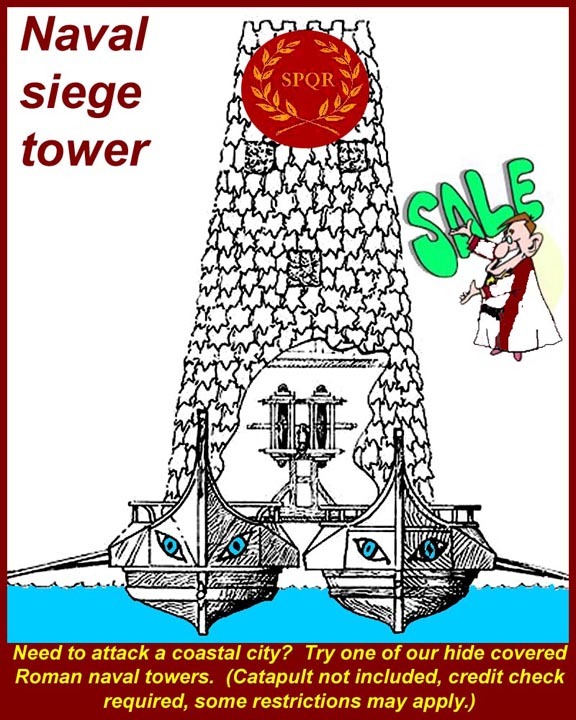 As we have seen, the Romans figured out how to attack Punic port cities with siege towers mounted on ships. All they had to do was keep the inhabitants from fleeing inland. The Romans had troops ashore from the beginning, but they were faced by Hamilcar Barca, an experienced Carthaginian General who relied on quick movements and lightning attacks; he had earned the name Barca, which means "Lightning" in northern Semitic languages. Both the Romans and the Carthaginians initially used the Macedonian phalanx, and the Romans were outclassed by the Carthaginians. The Romans soon started to line up and to arm their troops differently -- they lined up in maniples, smaller more maneuverable units, and each trooper carried a short Iberian sword called a gladius and a large body sized shield instead of the long lance and shorter shield of the phalangist. The phalanx of spears looked and was formidable -- the lances were more than twenty feet long and the moving front edge of the phalanx prickled with the lances of four to five following rows of marching lancers. If one lancer fell, his whole file (sixteen or more deep) moved forward and never stopped its forward progress. 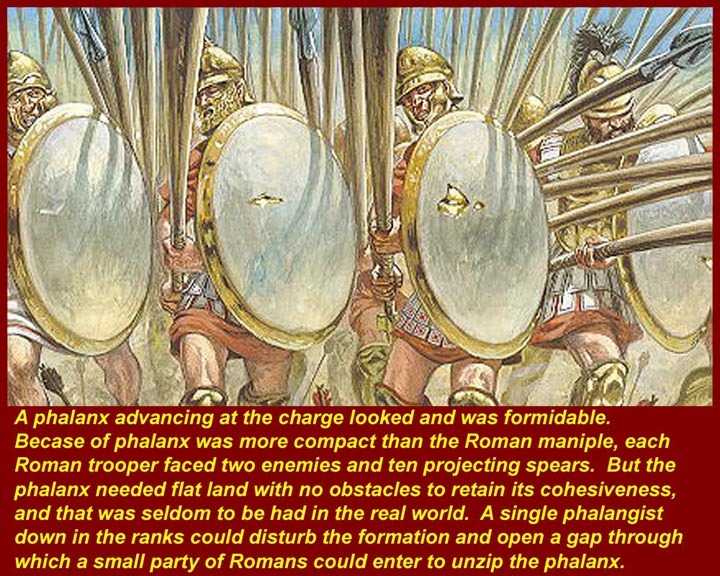 And that was the problem with the phalanx. It could move forward, but all those interlayed long spears made turning virtually impossible. A turn would require all the spears to be lifted simultaneously (causing great vulnerability while they were up), then all the men would have to turn 90 or 180 degrees, then all spears would have to come down again. Diagonal movements -- anything other than forward, back, or sideways required the phalanx to wheel in unison. Any of these movements would be hard to coordinate in the heat of battle. In anything other than flat, obstacle-free terrain, phalanges could quickly just get stuck in one position. 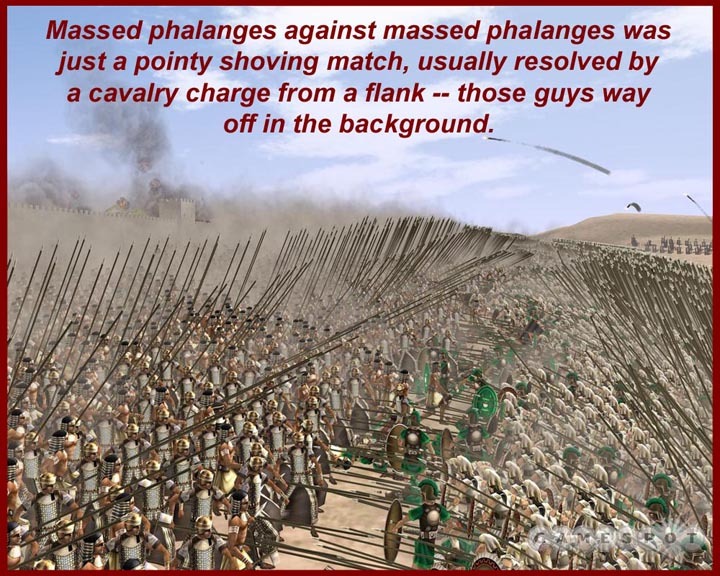 When both sides used the phalanx, they would march at each other and then engage in a shoving match. Phalanx flanks were extremely vulnerable to attack by auxiliary cavalry. 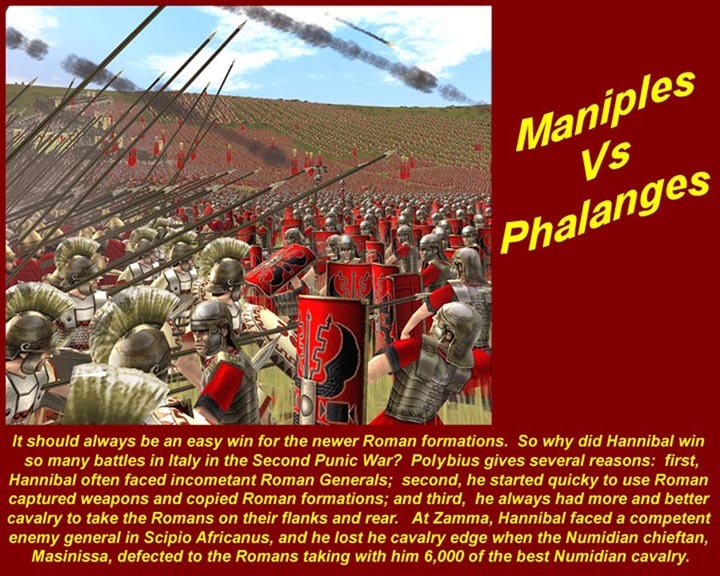 Even if the phalanx could continue to attack in a forward direction, it was vulnerable to the new Roman deployment. Maniples were massed into legions, but they could move independently in any direction -- even lone troopers could fight in any direction that was necessary. In a front-on battle, each Roman troop might face as many as ten lances, but let him step between the lances and he could kill a lancer, slide sideways a bit and kill another, and another. If a number of Roman troops did the same, they could cut right through a phalanx. And that's what Roman troops were trained to do. The normal forward movement of Roman units (as trained) was to step forward and thrust with the gladius to the right side (between the enemy shields), and repeat, and repeat. So why did the Romans loose battles? all the early battles in the 2nd Punic war? Basically due to lack of competent Generals and to shortages of cavalry. Meanwhile, Hannibal quickly abandoned the Phalanx and did what the Romans did. Having lost the war at sea, Carthage accepted a punitive treaty and simply abandoned Hamilcar Barca and his men on Sicily. 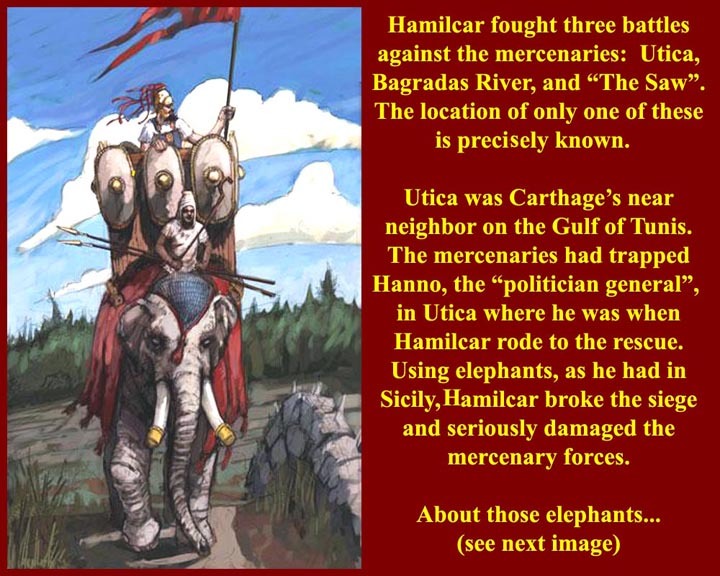 Hamilcar fought on using guerrilla tactics for a while, but he eventually made a deal with the Romans, who allowed Hamilcar to evacuate his men and their weapons. Hamilcar returned to his estate in the Tunisian countryside and left his subalterns in charge of the evacuation. The Firsts Punic War was over. 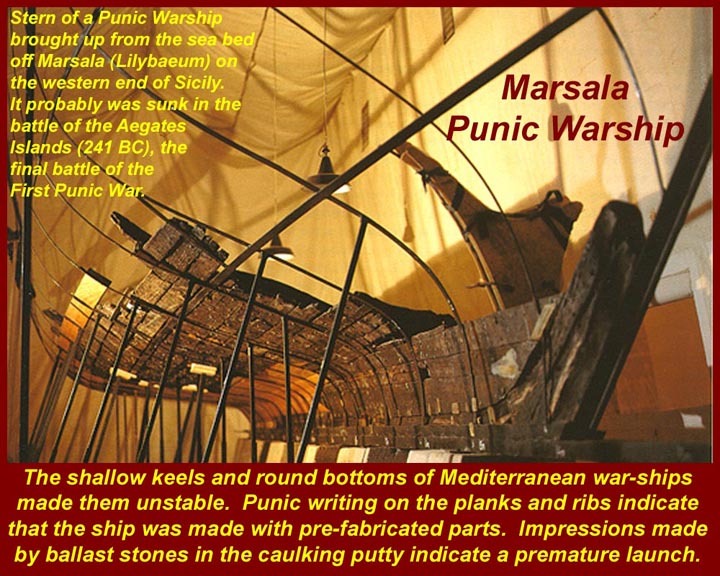 For additional images and more detailed information on the First Punic War, see http://www.mmdtkw.org/CNAf003FirstPunicWar.html. 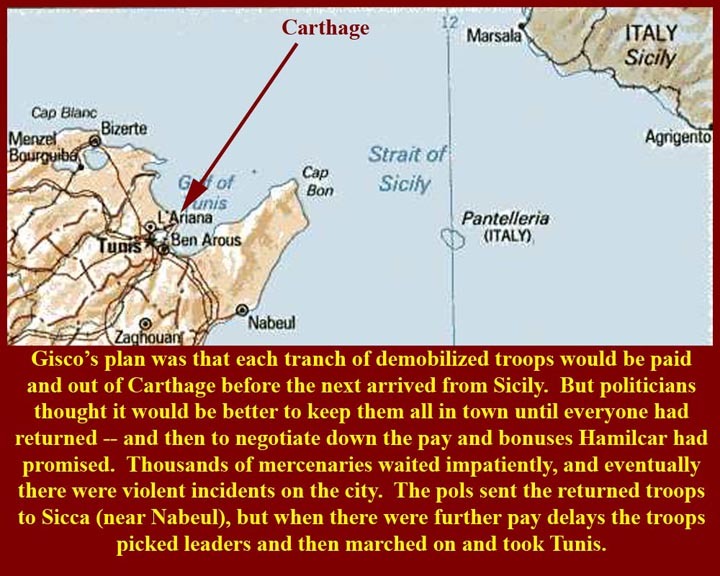 The plan devised by the subalterns was good; Carthaginian troops (mostly mercenaries, as usual in the Carthaginian forces) were sent Carthage city in tranches to be demobilized and be paid out and sent out of town before the next tranche arrived. But the penny-pinchers in the Carthaginian Senate decided to keep all the returned troops in town and then try to negotiate a cheaper payout. The result was many too many disgruntled troops in town. There soon was violence. The Carthage Senate finally sent the mercenaries to a neighboring town with a promise of cash to follow, but then delayed again. The mercenaries chose leaders and marched on and took Carthage city. The Senate finally agreed to pay them out, but it was too late. The mercenaries had realized their strength. They took the proffered money and then moved on to Utica. The Senate reluctantly asked Hamilcar Barca to put down the mercenary rebellion knowing full well that he just might take power away from them. Hamilcar ruthlessly put down the rebellion in three battles, the location of only one of which is known. 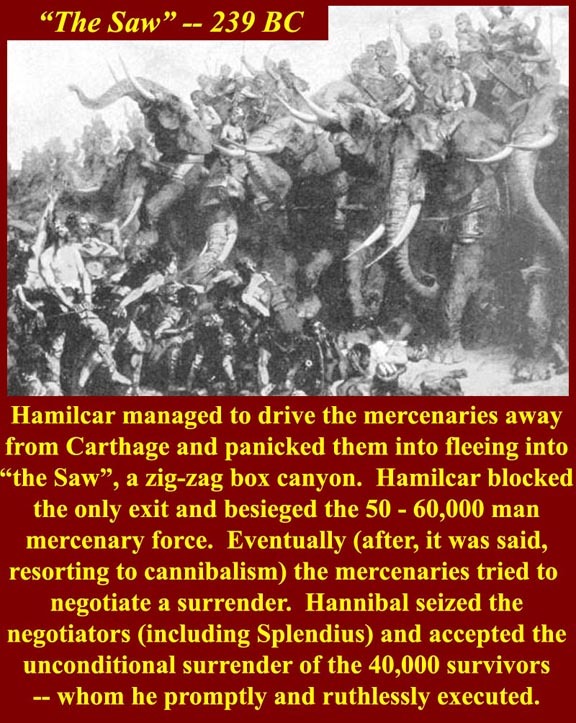 After accepting the unconditional surrender of the the mercenaries after the final battle -- a siege at a box canyon called "The Saw"-- Hamilcar slaughtered all 40 thousand prisoners, the mercenaries and other tribesmen who had come to their banner. He then marched back to Carthage. Strictly legal: The treaty that ended the First Punic War imposed massive monetary penalties on Carthage to be paid over twenty years. 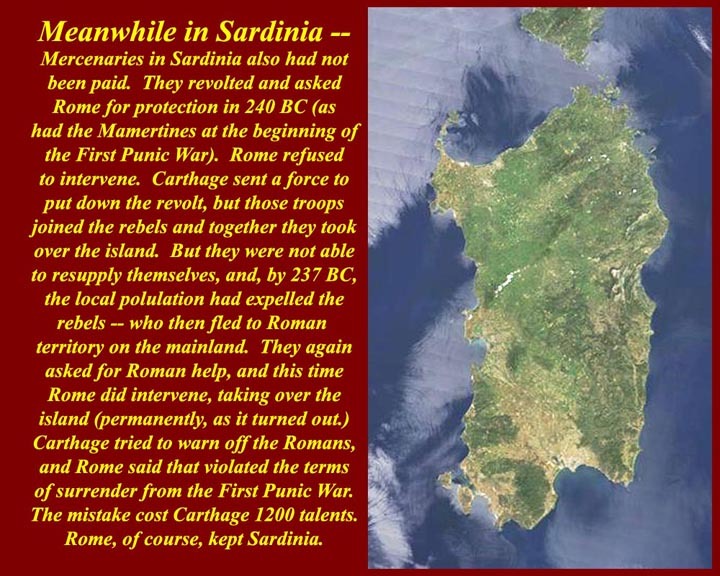 That may have been why the Carthaginian Senate didn't want to pay the back salaries and bonuses that Hamilcar had promised the mercenaries when he was trying to keep up the fight for Sicily. Anothe result of the financial squeeze was that Carthage could not pay its bills for ship-building materials and pay its mercenary garrisons in Corsica and Sardinia. The garrisons revolted and offered their future services -- and the islands -- to Rome, but Rome refused. The Punic settlers on the islands asked Carthage to put down the revolt of the garrisons, but Carthage refused. The settlers eventually defeated the garrisons and took over control of the islands. They asked for Roman protection, and this time Rome agreed. It was all strictly legal -- once the mercenary garrisons lost contol, according to Roman legalists, Carthaginian possession of the islands lapsed, and the people of the islands could freely place themselves and the islands in Roman hands. All strictly legal. Rome got the islands and with them the all-important forests that would build Roman fleets and not Carthaginian ships. 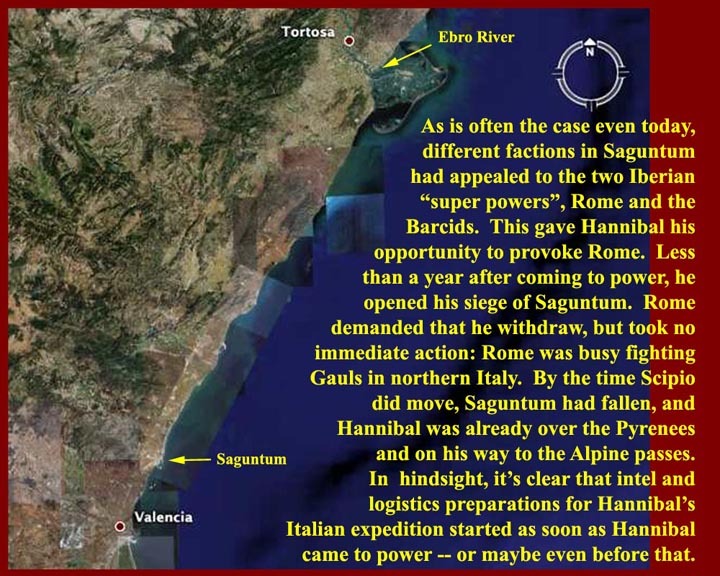 The solution to the Hamilca Barca problem faced by the Carthaginian Senate was to give him something that would take a long time to digest -- he would not soon come home hungry. The lower half of the Iberian peninsula (which turned out to be the most valuable half) had been in Punic hands for some time. Hamilcar was sent to Iberia, knowing he would not be able to resist the opportunity to conquer the rest of the peninsula. He set off with what henceforth would be known as the "Barcids" and took on the task. Iberia became a Barcid Family operation with brothers and sons taking over various portfolios. In a short time, Iberia was more productive and rich than the North African homeland. The Capital of Barcid Iberia, another Kart Hadasht ("New Carthage" to the Romans and Cartagena today) was soon the economic powerhouse of all the Punic territories, and Iberia was also certainly the center of Punic military power. Hamilcar concentrated this military power on overcoming the "Celto-Iberians" of the northern half of the peninsula. He had some success, but the job was not done when he drowned crossing a river on his way to yet another battle. 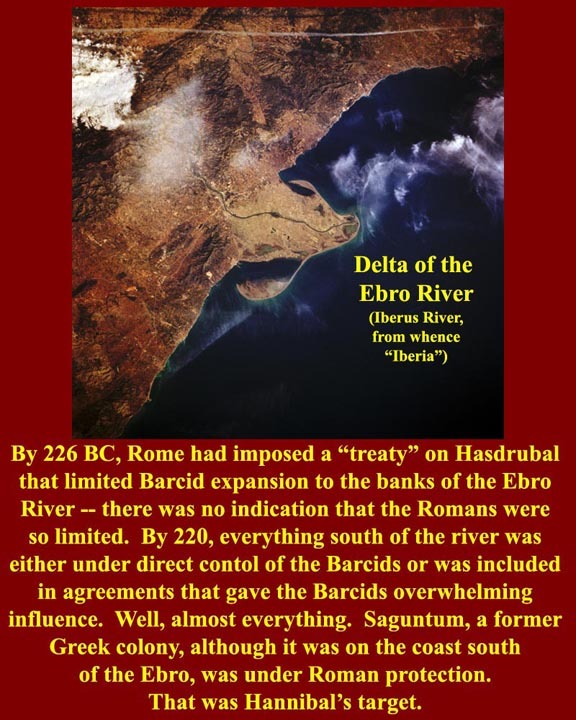 His son-in-law, Hasdrubal the Fair, used diplomacy more than force to consolidate the peninsula and also made an important new treaty with Rome that fixed the Ebro River as the boundary between their spheres of incluence. (FYI, Iberia is named after the Ebro River.) Hasdrubal was killed by a Celtic assasin in 221 BC. 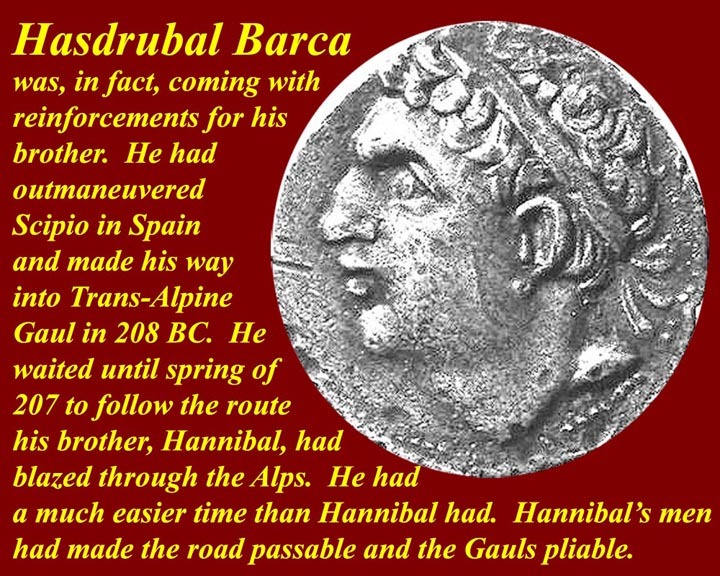 At 26 years of age, Hannibal, the eldest son of Hamilcar Barca, succeeded Hasdrubal, and things again took a military rather than a diplomatic turn. 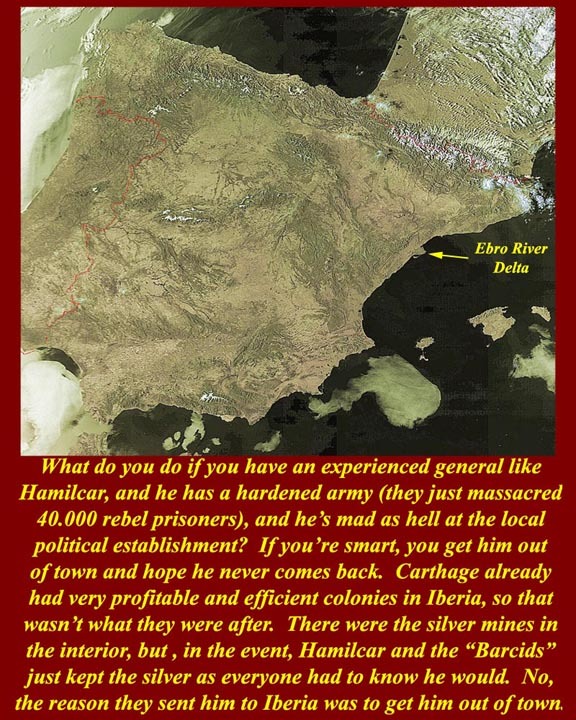 For more images and more information on Barcid Spain, see http://www.mmdtkw.org/CNAf004MercenaryWarBarcidSpain.html. 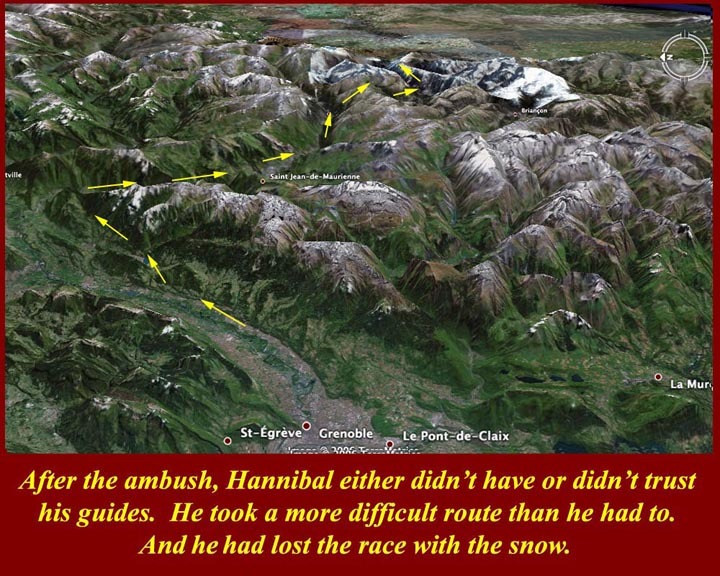 Before he could cross the Alps, Hannibal had to cross the Pyrenees. His column of 90,000 infantry, 20,000 cavalry, and a huge bagage train was reduced to 50,000 (infantry and cavalry) before he reached the Rhone River. 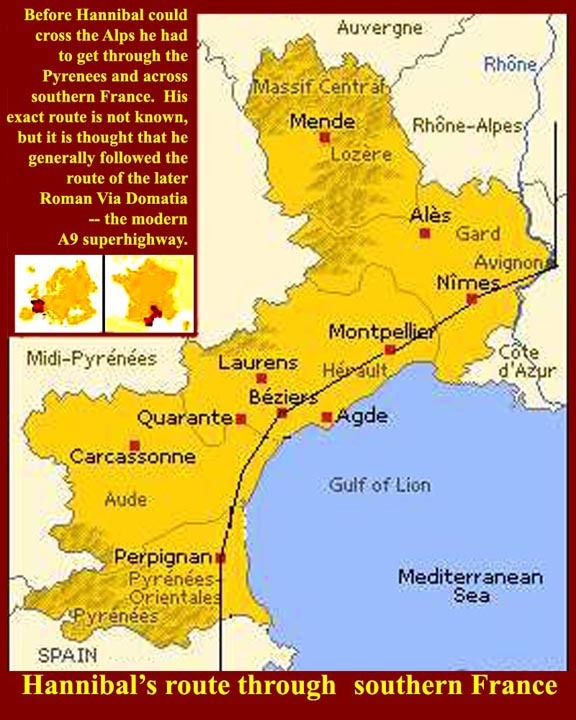 He had thought to continue along the coast and take the easier coastal routhe through the Alps, but he had no way of knowing that the Roman fleet on its way to Saguntum, commanded by one of the Scipios (the father of Scipio Africanus the Elder) would stop to resupply and re-water at Massilia (= modern Marseilles). 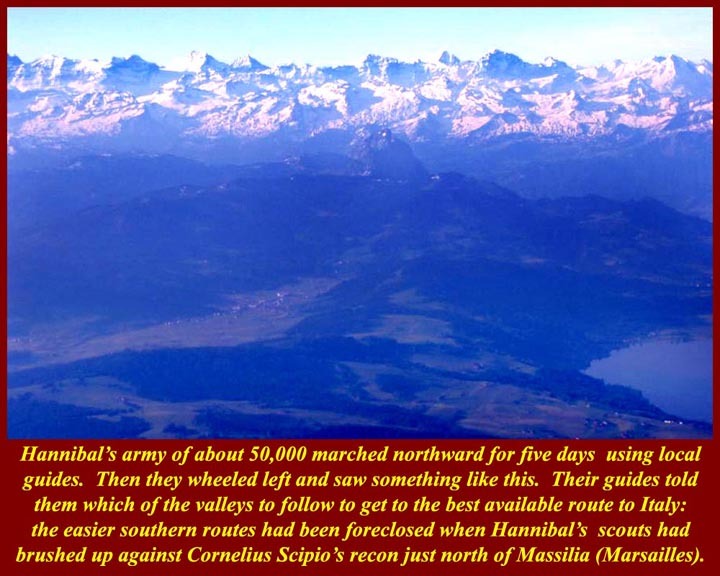 Scipio's pickets spotted the van of Hannibal's army. 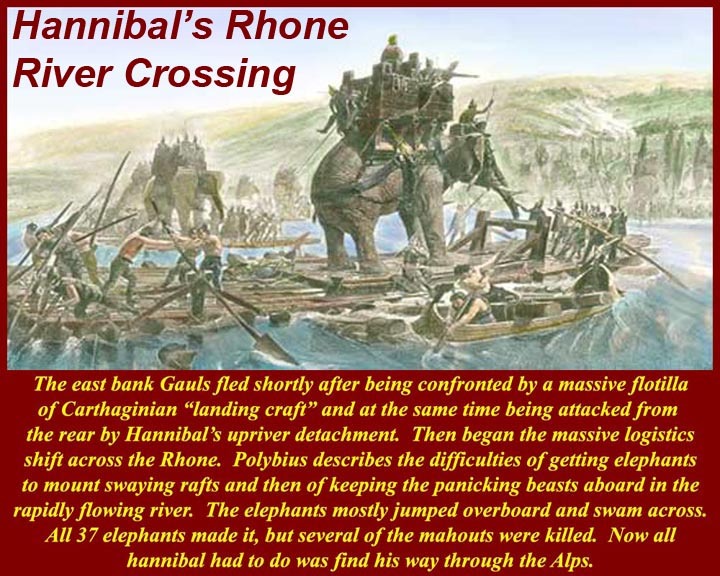 Hannibal swung north along the Rhone and was thereafter committed to a much more difficult route through the Alps. 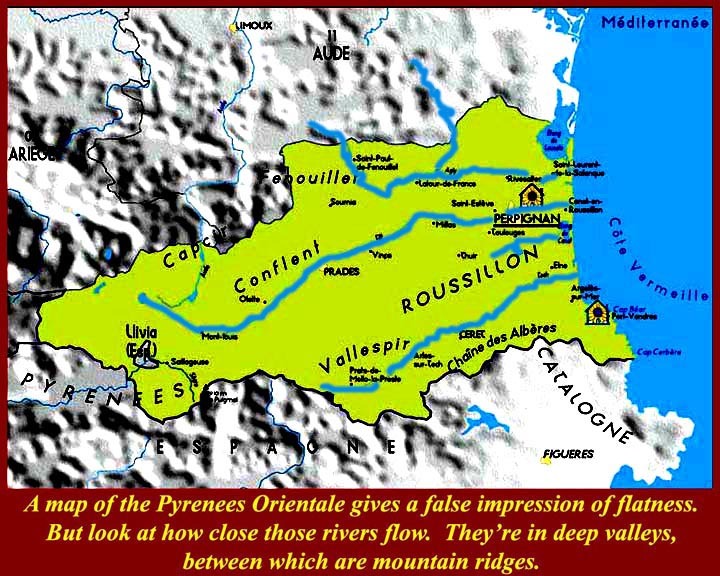 He crossed the Rhone some ways inland, probably just north of the delta. 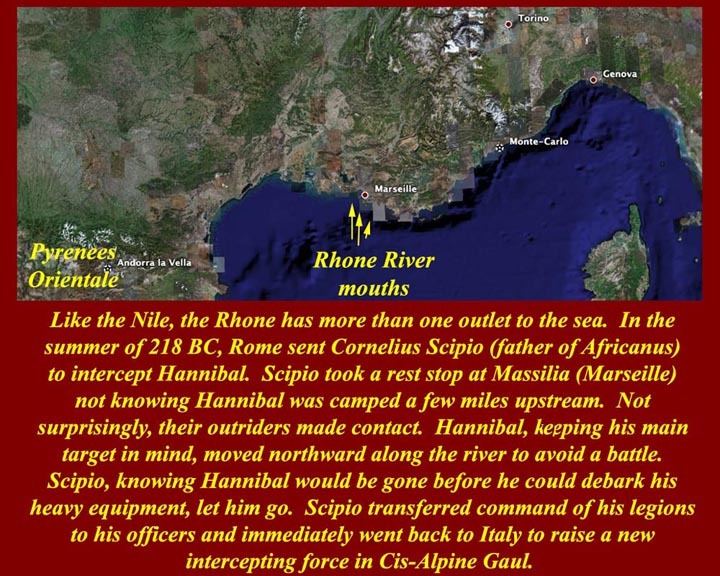 Scipio could not pursue Hannibal's army with the forces he had at Massilia. 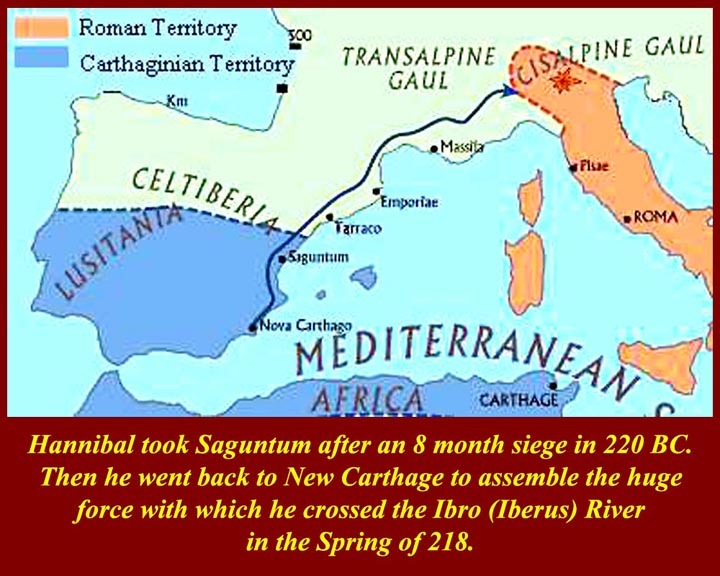 He sent forward the Saguntum relief force under subalterns and himself went back to northern Italy where he would organize a force to meet Hannibal. 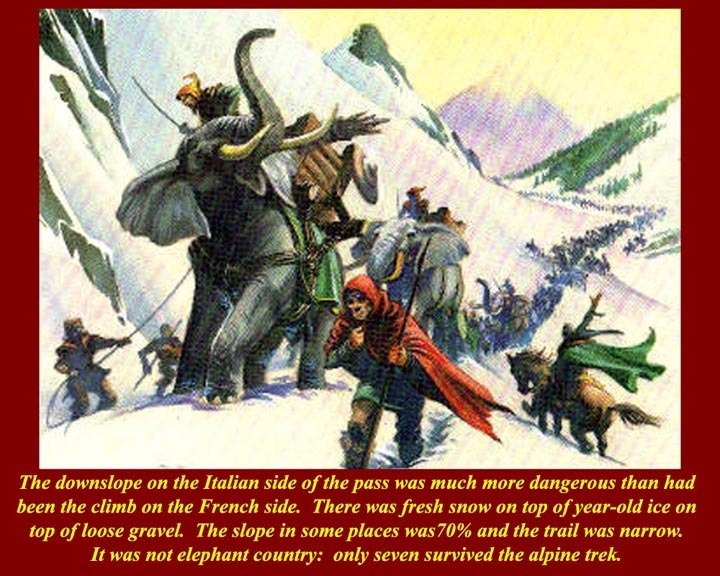 This is a graphic representation of the shrinking of Hannibals force as it moved from Iberia to the Italian side of the Alps. 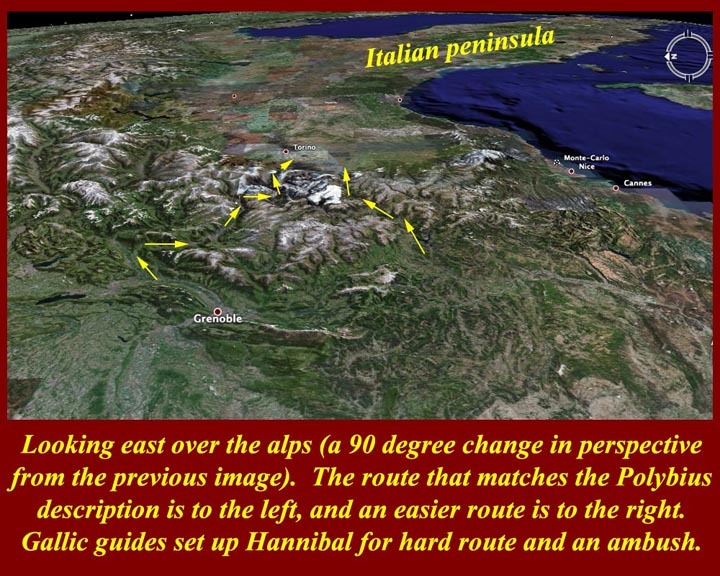 Polybius and Livy describe the condition of the downward slope into Italy as having new snow falling and fallen on snow from the previous winter. 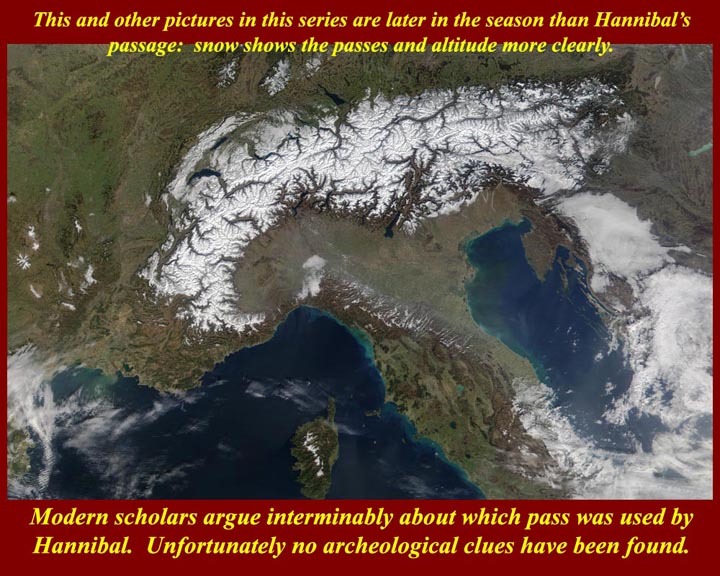 That's one of the main clues about Hannibal's route, as that only happens in the Clapier Pass. It also describes the danger of the descent. 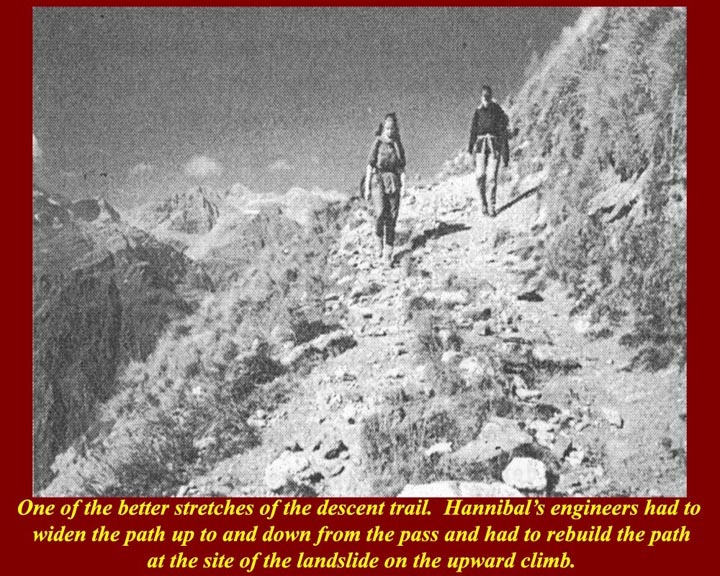 The snow covered slope is extremely steep, and, the year of Hannibal's passage, it was even more treacherous because of a recent rockslide that completely blocked the trail. The landslide debris had to be moved to get the infantry and elephants past the blockage. 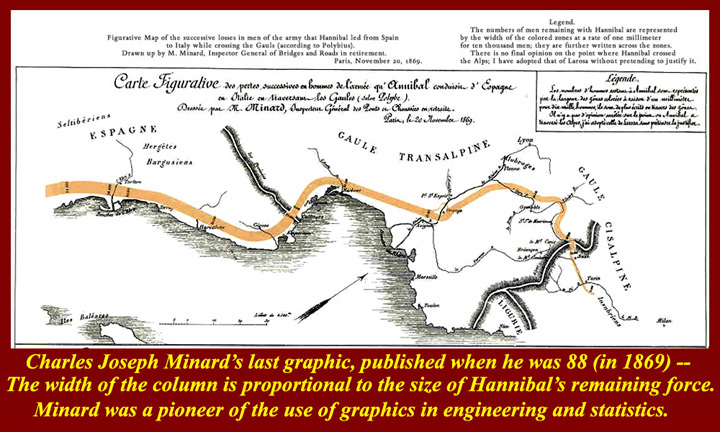 In the several days of getting past the landslide, Hannibal lost more than 10,000 men. The army straggled down into the Taurini plain with about 35,000 exhausted troops and only seven remaining elephants (out of 50 that started). Six more elephants died soon thereafter from exposure, exhaustion, and possibly starvation. 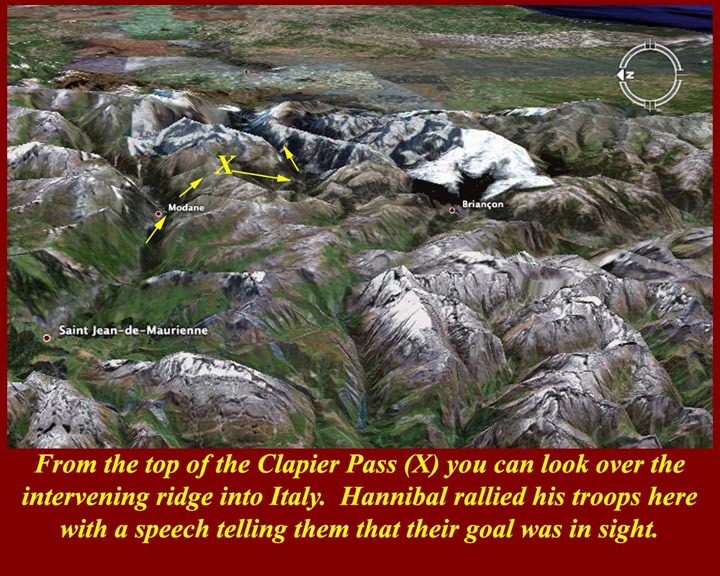 Hannibal's scouts had been in communication with Gaulish tribes on both sides of the Alps probably for at least a year. A Transalpine Gaul tribe had betrayed and ambushed him. Now he was face to face with the Taurini Gauls (who gave their name to modern Torino = Turin). 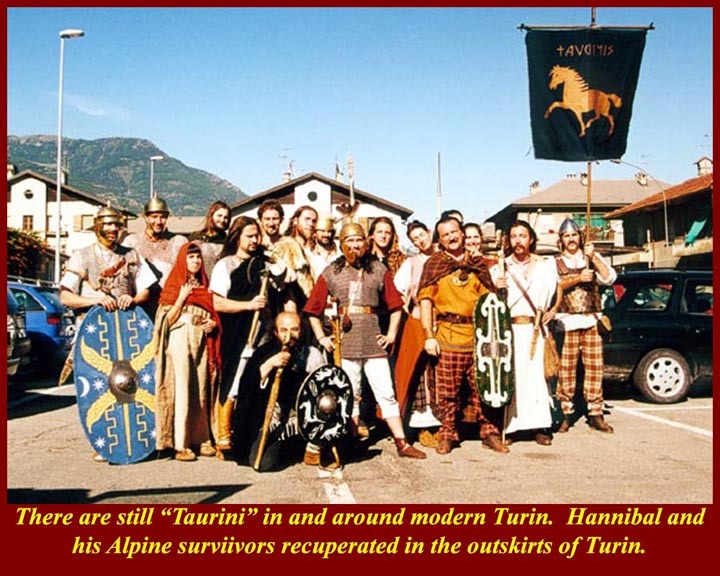 The Taurini Gauls were expected to join up with Hannibal's forces and fight together against the Romans who had just recently occupied Taurin territory. 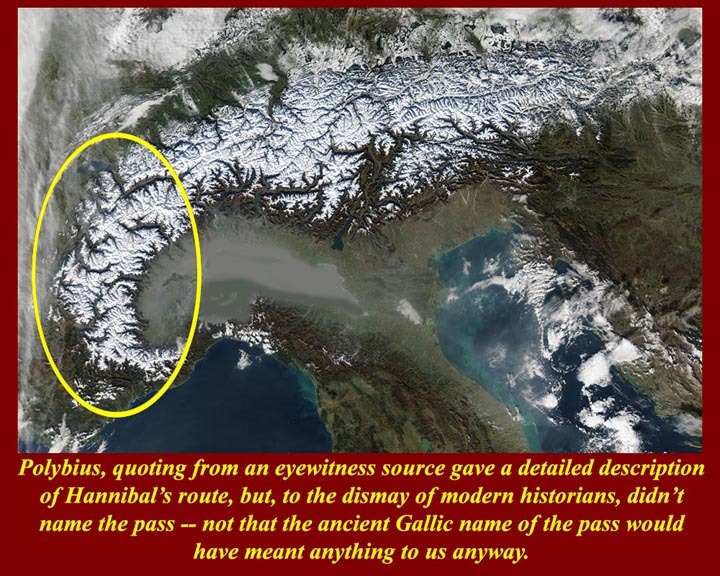 But the Gauls were not initially impressed by the straggling remnants of of Hannibal's army. 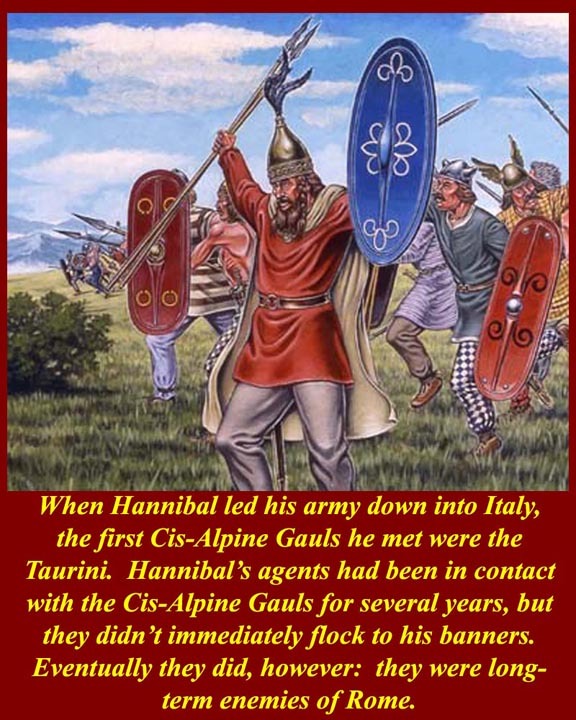 Within a short time, however, after Hannibal received some reenforcements of men and supplies through northwest Italian ports, the Taurini Gauls did join up. It also helped that even Hannibal's depleted forces were able to win some great victories in the north against badly led Roman armies. 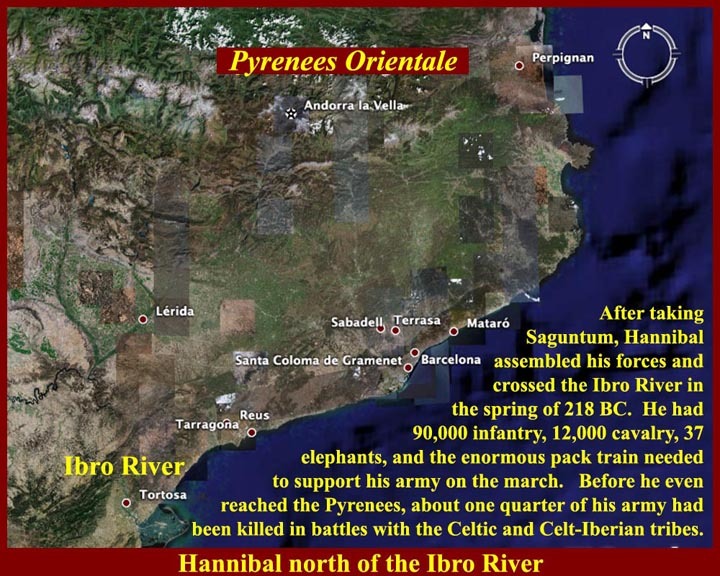 The Romans lost major battles at Trebia and at Lake Trasimene. At Trebia General Sciopio was saved by his son, who would become Africanus the Elder. At Trasimen, the Roman army was lured into a trap and was cut to pieces between the lake shore and the hills above the lake. And there was an even greated debacle at Cannae. Roman forces there were suckered into the sagging center of the Carthaginian line. Carthaginian auxiliaries and cavalry closed the sack trapping 60,000 Roman troops inside. 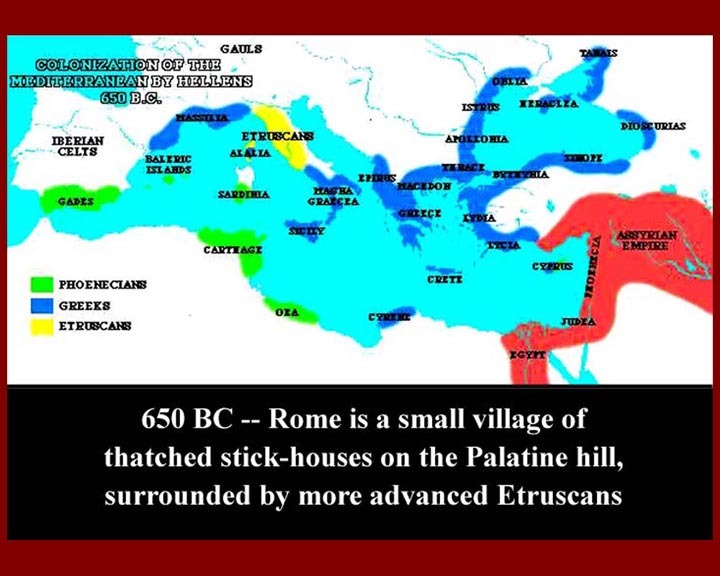 It took several hours for the Cathaginians, by then fighting Roman style and with captured Roman weapons, to kill 50,000 surrounded Romans and to capture 10,000 more. Only a few thousand Romans escaped, many of them cavalrymen, to carry the horrible news back to Rome. Those who escaped were permanently garrisoned on Sicily as punishment for the great loss. Rome's manpower pool was severely depleted. 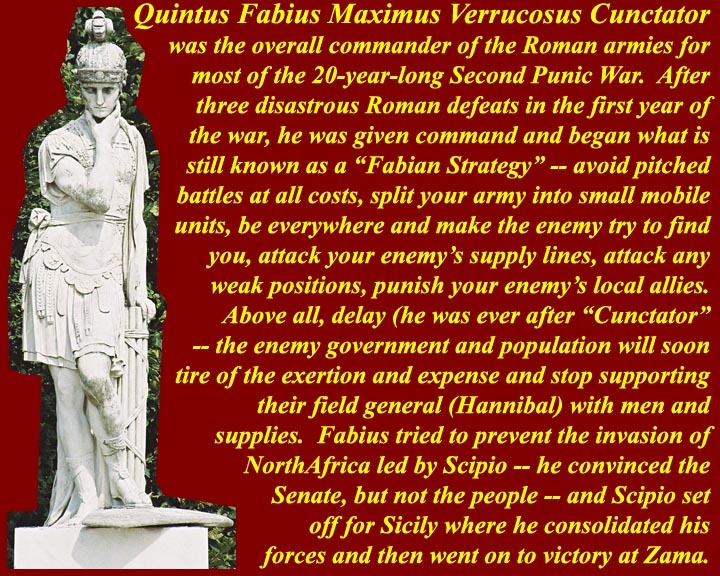 It was after Cannae that Fabius Cunctator became the chief Roman strategist and commander. Cunctator meant "Delayer", and that's what he did best. Cannae, which occurred in 216 BC was the last set piece battle until the Battle of Metaurus in 207 BC, and Metaurus was on a much smaller scale. 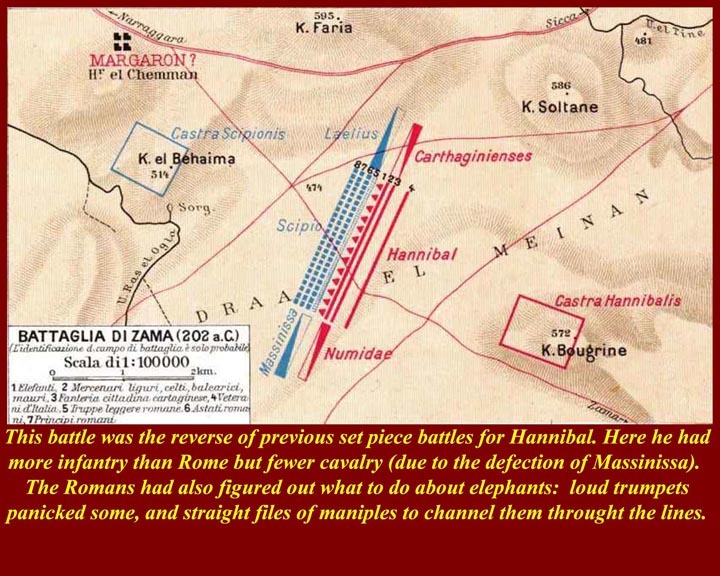 Hannibal had tried everything to provoke the Romans to do battle, even at one point marching toward Rome (and he probably could have taken it if he tried). Despite all his efforts, Hannibal never got another set piece battle in Italy. He could take outlying towns, but he couldn't hold them; his army had to live off the land and couldn't stay in one place for long, so he had to move on leaving any towns/territory he conquerred to fall back into Roman hands. 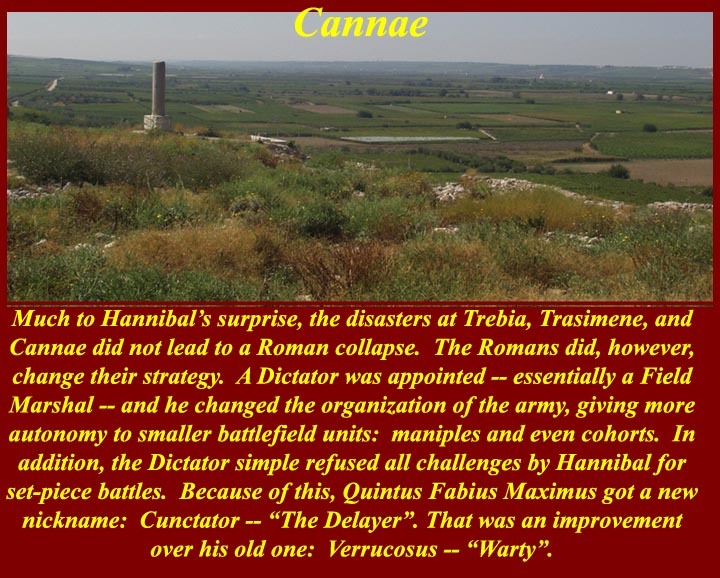 Some towns taken by Hannibal tried to ally themselves with him, but the severe punishment meted out on such towns by the Romans, after Hannibal had to move out, soon stopped such defections. 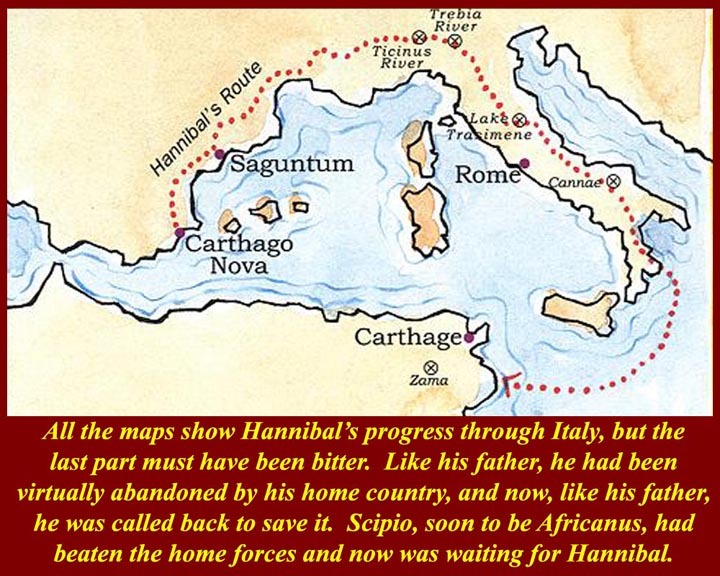 Hannibal was meanwhile depleting his forces and supplies, and Rome always was able to find more men and supplies. 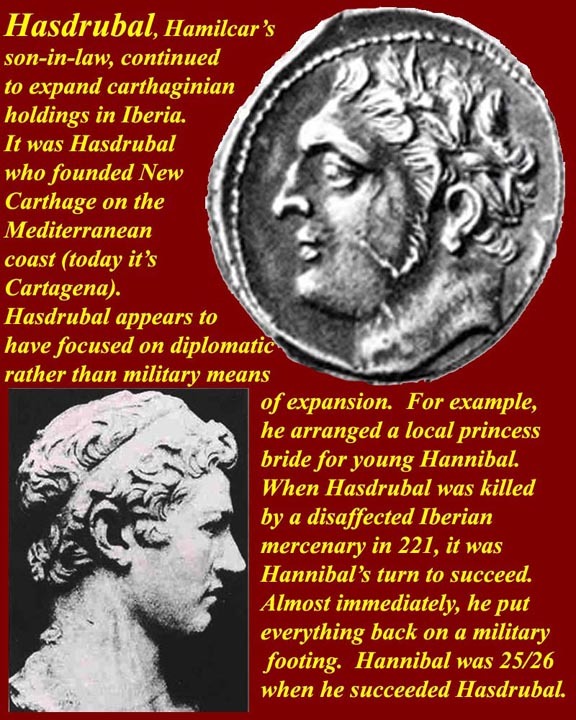 The Battle of Metaurus was fought by Hannibal's younger brother Hasdrubal, the second son of Hamilcar, who had led a relief column through the Alps after he had barely escaped from an Iberian battle against that Scipio who would become Africanus the Elder. The Romans won at Metaurus and, according to legend, sent the head of Hasdrubal to his brother Hannibal as a sign that all was lost. The Romans, after Metaurus -- at least some of them -- had regained their confidence. Scipio (later Africanus, Elder) had roundly defeated the Punic remnants left in Iberia. He rushed home with the mad idea of leading an expedition to North Africa to take on Carthage on its home ground. 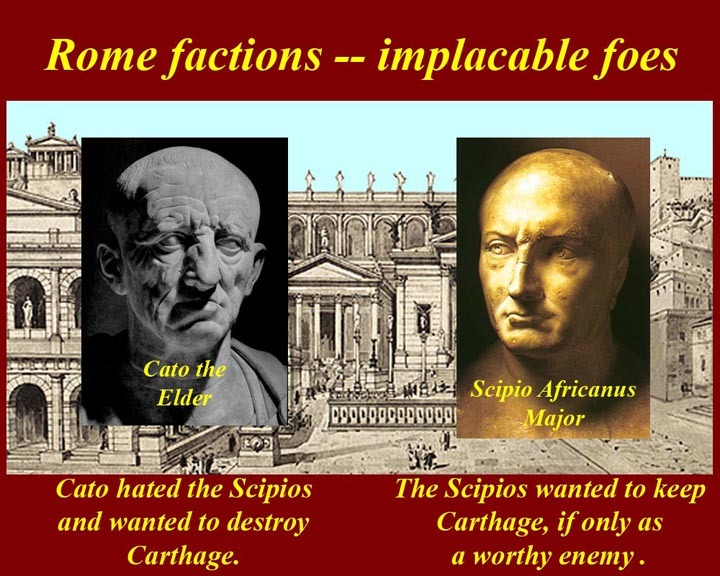 In 205 BC, Scipio was elected Consul, but Fabius Maximus Cunctator and his senatorial followers defeated Scipio's invasion plan in the Senate -- too risky, and besides, Scipio might just become too powerful for the Senate to control. 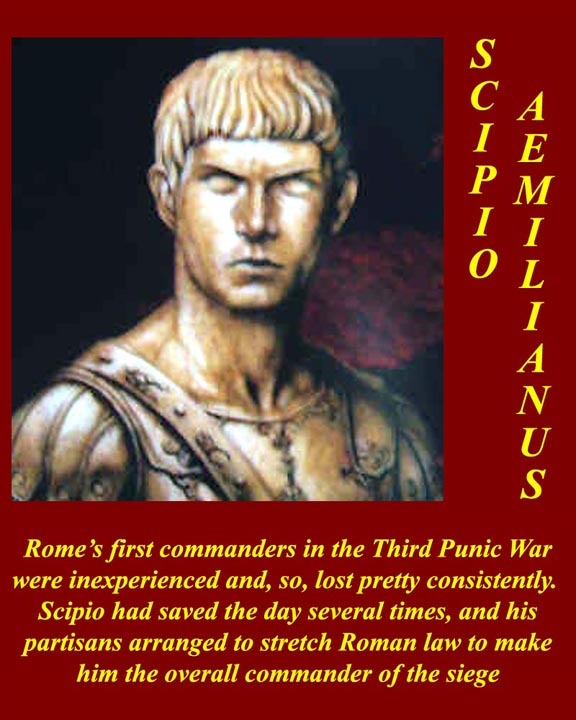 Scipio then got his plan passed by the people in a general comitium, effectively overruling the Senate. The Senate still had the purse, however, and refused to appropriate funds for the expedition and didn't give him an army. Scipio scraped up what money he could find -- from family and friends -- and headed off to Sicily. There he found more money from Roman agricultural speculators, who were doing quite well on island estates captured in the First Punic War and who were willing to risk some of their capital on the chance of gaining even bigger land grabs in North Africa. Scipio also offered all the veterans who had been sent to permanent garrison duty on Sicily after Cannae a chance to redeem themselves. They were eleven years older than they were at Cannae, and they hadn't really fought since Cannae, but they were keen to fight for their honor and to end their Sicilian exile. Scipio bought and built enough ships to carry his forces to North Africa and landed them near Utica. Carthage was only lightly defended and there was no General to lead what forces there were. Scipio easily defeated the Carthaginian home forces. In this crisis the Carthaginian Senate bowed to the inevitable and called Hannibal and his Italian expeditionary force home to Carthage. Hannibal gathered his forces and prepared to defend the homeland. He had elephants and a numerical advantage in infantry, and he thought he had enough cavalry to defeat the Roman force, which, of course was small -- mostly those Cannae veterans. "Thought he had enough cavalry?" Hannibal had brought in a Numidian prince named Syphax to lead thousands of well armed and well trained Numidian cavalry to the field. But he discovered in 203 BC that, since all the way back when he was romping through Iberia, Scipio had been in contact with a rival Numidian prince named Massinissa. Massinissa led a huge force of Numidian cavalry in a surprise nighttime attack of the camp of Syphax. 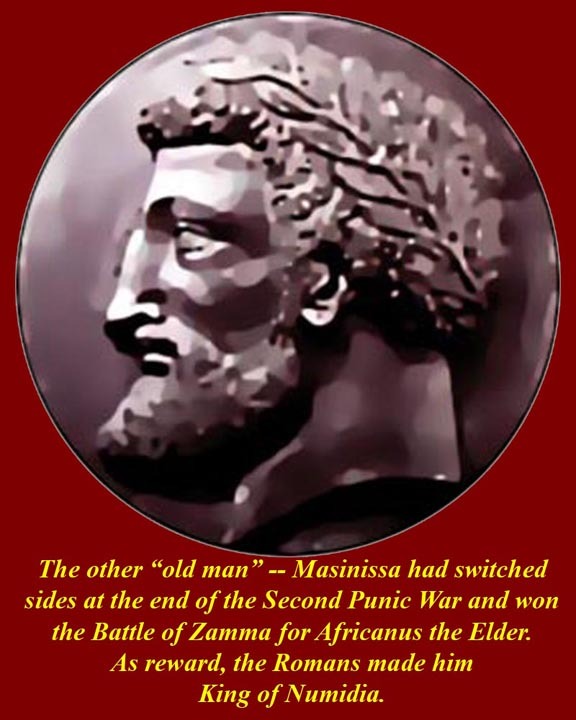 The element of surprize helped Massinissa even though Carthaginian regular troops were sent to help Syphax. The defeat of Syphax led to further defections of Numidians to the side of Massinissa -- and Massinissa was on the side of Scipio. 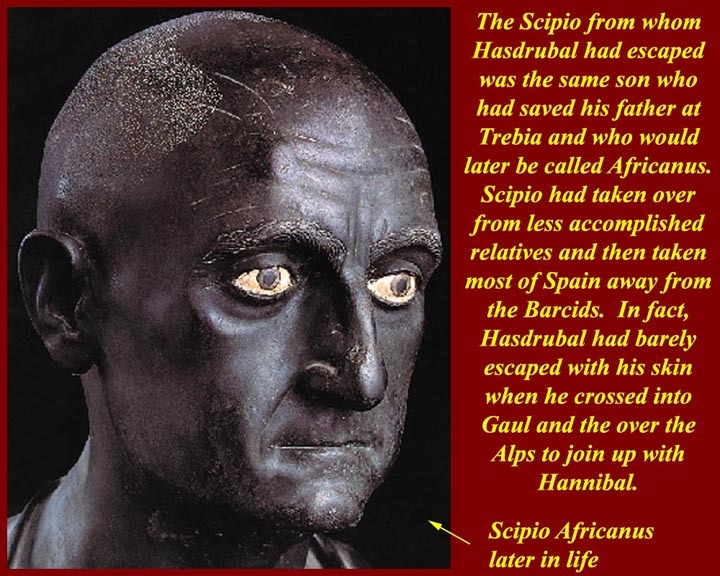 Scipio had made promises to Massinissa and Massinissa had made promises to the Numidian Cavalry, whose sub chieftains also probably realized (as Hannibal may have realized himself) that the Carthaginian cause was lost. We don't know exactly what deals were made, but we do know that when the armies lined up for the climactic battle of Zama most of the Numidian cavalry lined up with the Romans. 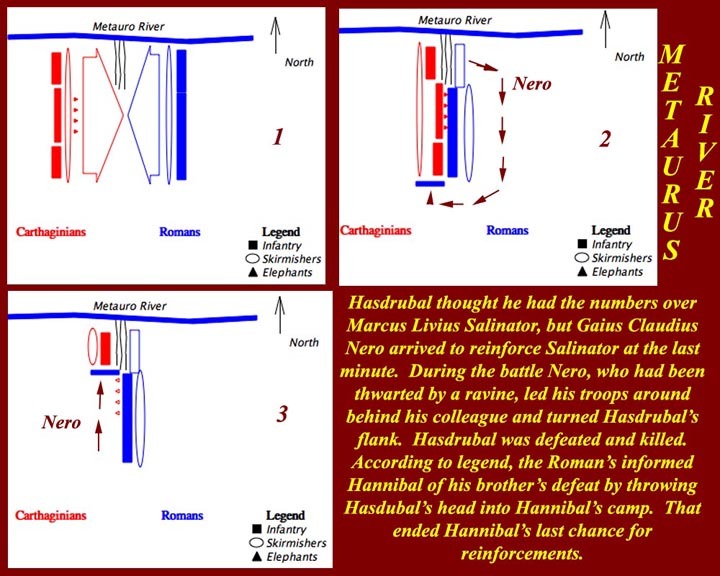 When Scipio faced Hannibal at Zama, it was a reverse of the situation in any previous set piece battle between the two sides. For once, Carthage had an infantry advantage, 50,000 to Rome's 34,000. But Rome, this time, had a decisive advantage of horse. Massinissa's 6,000 Numidians were added to 3,000 Roman cavalry. 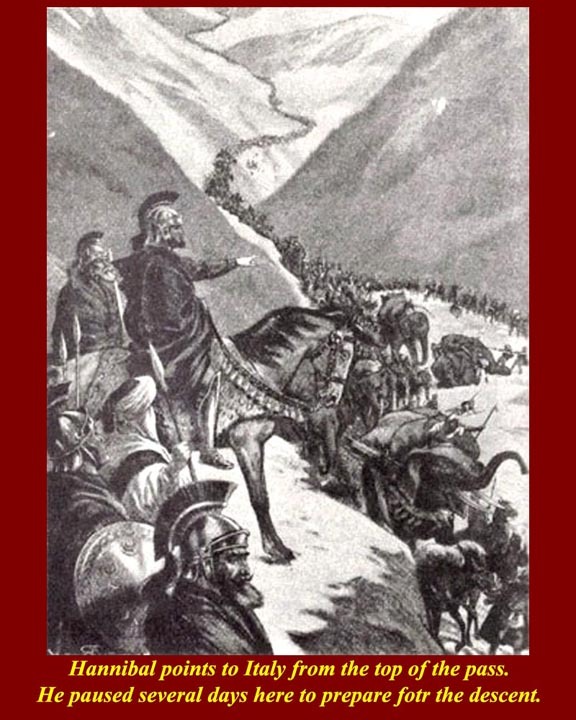 Syphax led about 3,000 Numidians to face Massinissa's 6,000. And fewer that 1000 Carthaginian mounted troops -- poorly trained and hardly "cavalry" faced the 3,000 Romans, some of whom, frankly, weren't much better than the Carthaginians. But the Romans were well mounted; Scipio had impressed at least 1,000 Sicilian "knights" into his army, and when they objected, he let them off on the condition that each would provide a good horse for one of the Cannae cavalry veterans. 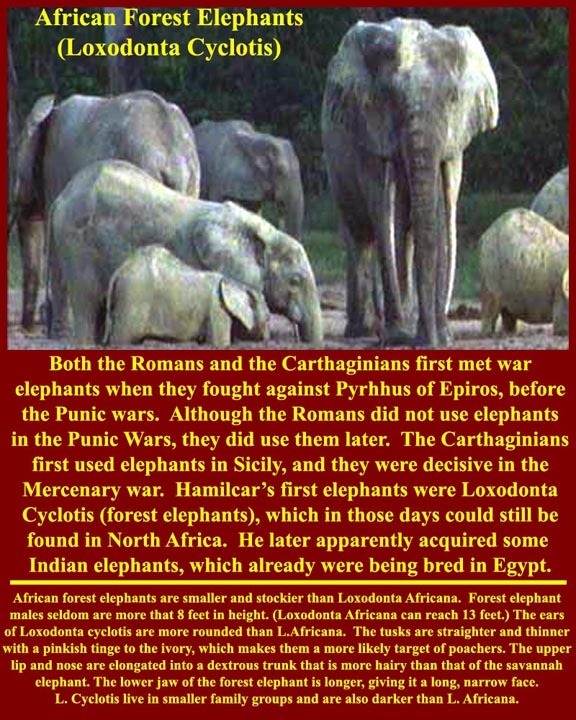 Hannibal had more elephants than he had ever had at any previous battle. He massed 80 of the beasts in front of his first infantry line. In the event, they were successful counteracted by the Roman infantry. At the very beginning of the battle Massinissa on one wing and the Roman cavalry on the other wing routed the smaller cavalry forces that confronted them. Meanwhile, the Roman infantry knew what to do against elephants. Roman trumpeters scared some of them into turning back and running through the Carthaginian infantry. Then, as the remaining elephants approached the Roman lines, the highly trained Romans opened gaps in their lines, through which the elephants ran. Elephants will only charge into people if they have no other choice. 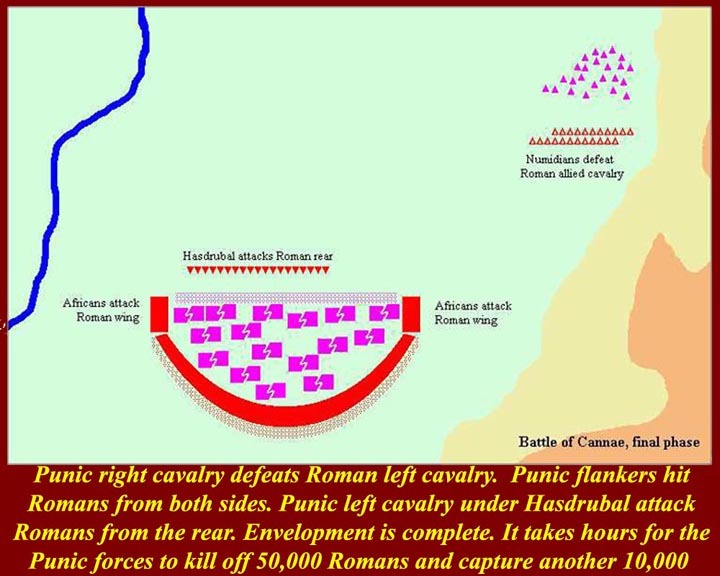 As the elephants charged through the gaps, the Romans speared them in their flanks, killing many. Those that were not killed ran panicky through the gaps and off the back end of the battle field. 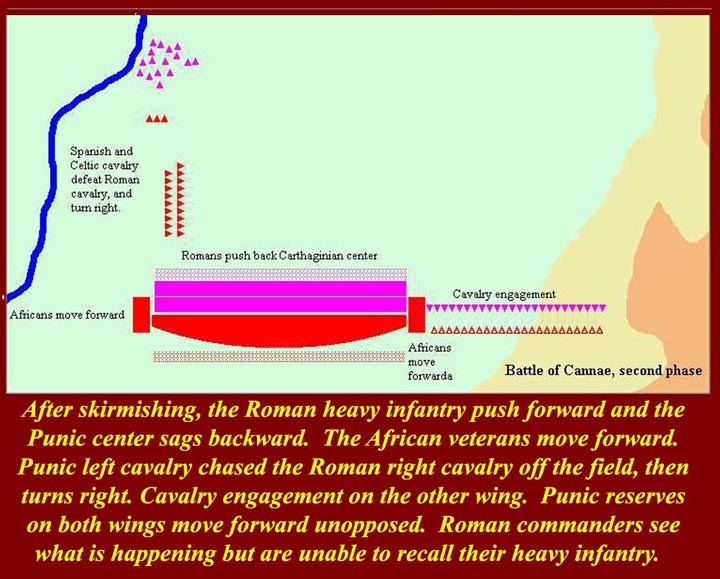 After the elephants were gone, the Romans closed the gaps and did a standard Roman infantry charge into the poorly trained Carthaginian front line and through it, and then through the Carthaginian second line. 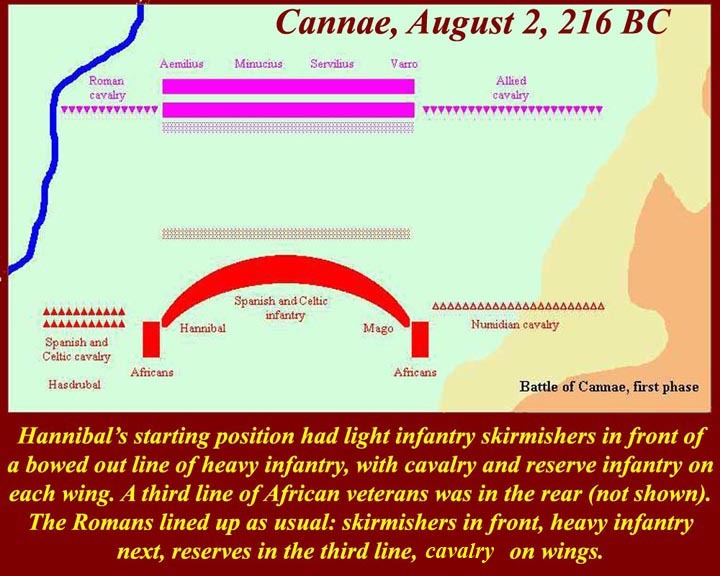 Just as Hannibal's veterans in his third line were about to engage the now tired Roman front line, the Romans dropped back and and gave way to their own second line -- and Massanissa's and the Roman cavalry returned from their chase and crashed into the rear of the Hannibal's army. 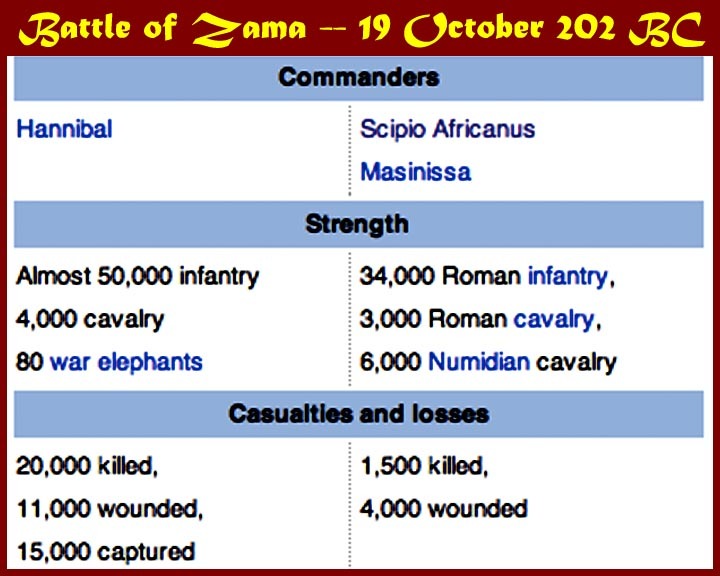 By the end of the Zama battle almost the whole Carthaginian force was dead, wounded, or captured, whereas the Romans had relatively few casualties. The second Punic War was finished and Rome was once again victorious. 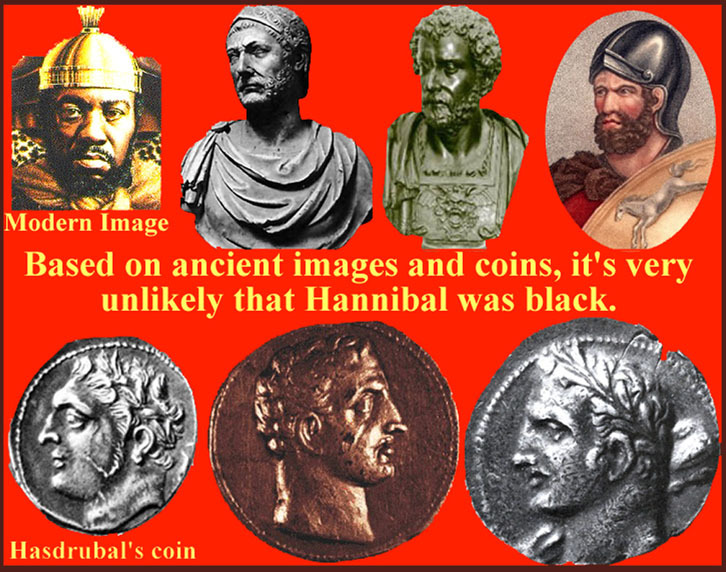 Hannibal was allowed to go free as a mark of respect for his abilities, and, in fact, became, for a while, one of the chief magistrates of Carthage. The price for peace that Rome exacted was high. 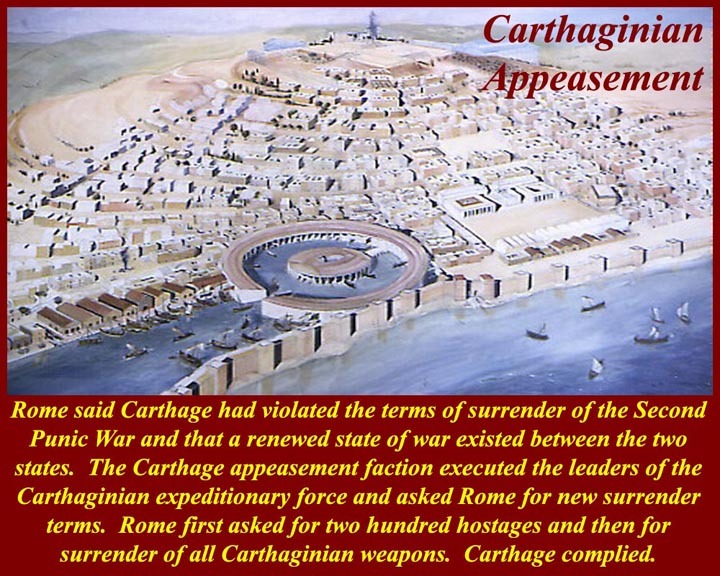 Carthage had to disarm including dismantling its war fleet, it had to cede all captured North African territory to Rome, and it had to seek Roman approval for any local military activity. Finally, Rome demanded crippling monetary payments stretched out for years into the future -- or at least Rome wanted them to be crippling, but Rome hadn't reckoned with Carthaginian business acumen. 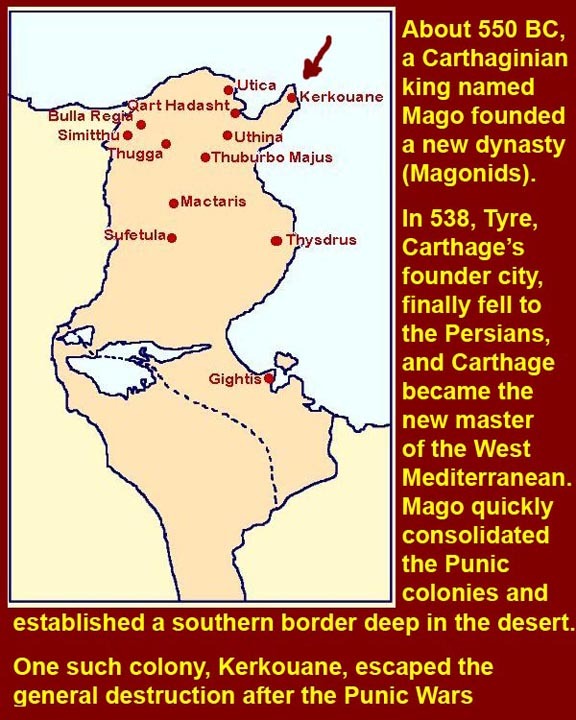 In just one generation Carthage was back at the top of the Western Mediterranean commercial heap. As noted above, our main source of information about the Punic wars is Polybius, but his books on the Third Punic War are lost. 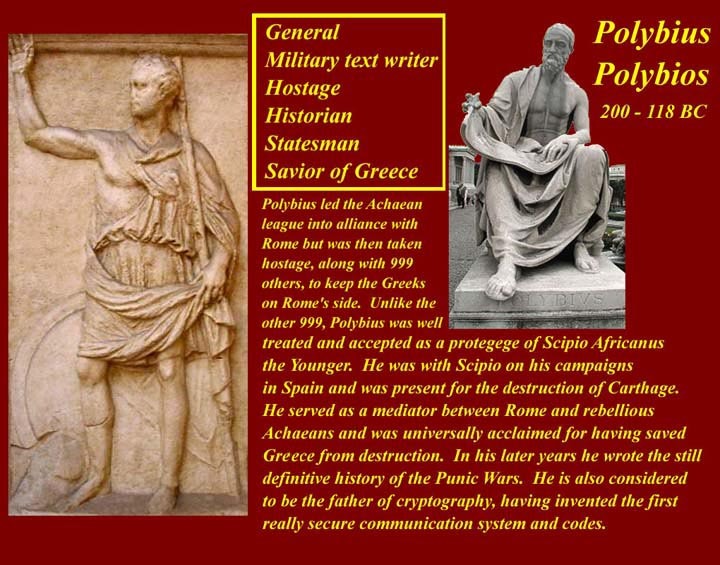 Luckily when Appian of Alexandria wrote about the Third Punic War, he used Polybius as his main source, so we still have Polybius, albeit filtered by Appian. 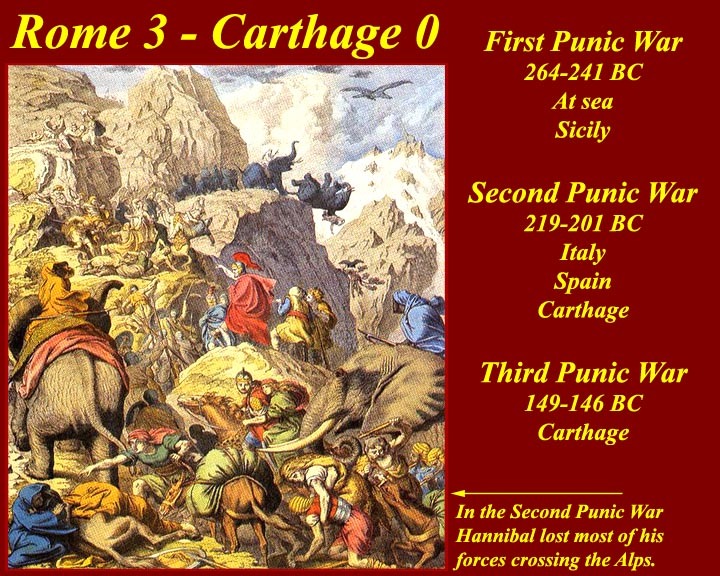 For more images and information on the Third Punic War, see http://www.mmdtkw.org/CNAf007ThirdPunicWar.html. By 149 BC both Rome and Carthage were riven by factions. Cato and his faction in the Roman Senate (who had started out as ideological followers of Fabius Maximus, who had died in 203 BC before the end of the Second Punic War) had now become hawks. For years, Cato famously ended every one of his many Senate speeches by saying the "Carthage must be Destroyed". They were opposed by the Scipios and their faction. 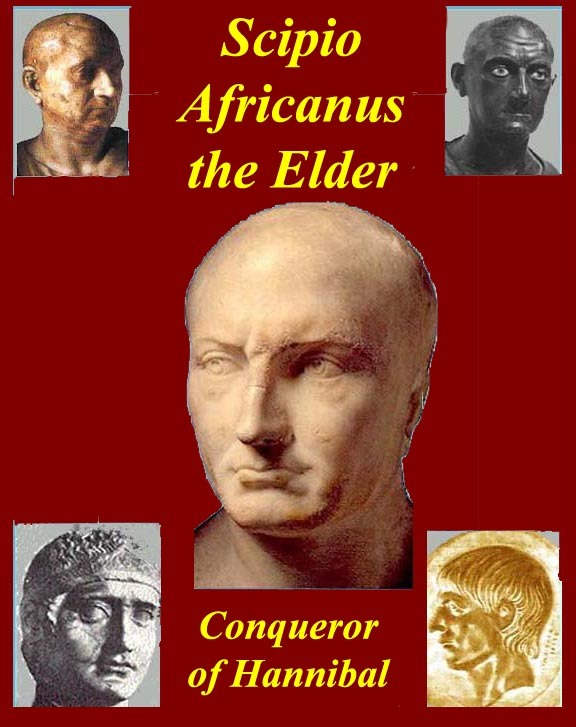 Scipio Africanus the Elder had died in 183, but a relative, who had been adopted by a son of Scipio Africanus the Elder, was moving forward from the political horizon. This new Scipio, already using the agnomen Africanus (the Younger, by inheritance) acknowledged that Carthage was a potential danger to Rome (economic if not otherwise) but wanted to preserve it as a worthy enemy, i.e., something against which to hone Rome's sword. Scipio had already honed the Roman sword in Spain when he put down a dangerous rebellion there in 151 BC. Meanwhile in Carthage there were three factions. 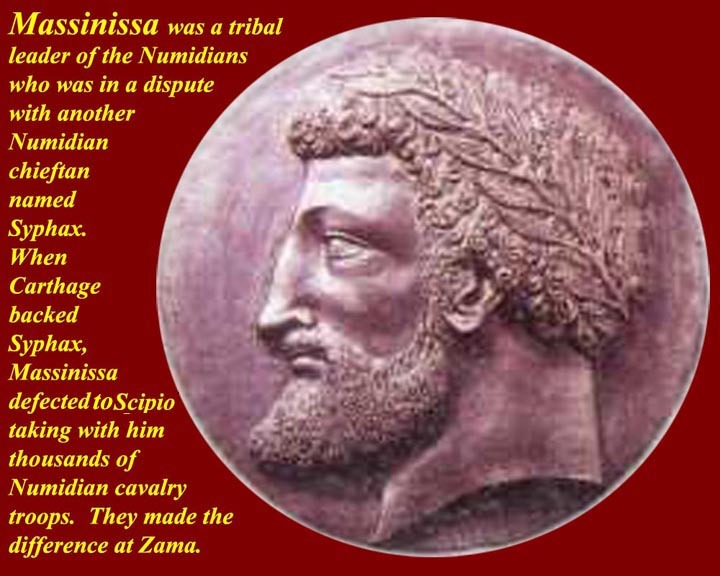 The Numidian leader, Massinissa, now an old man, was nibbling away at Carthaginian territory. One faction in Carthage wanted to take him on, despite Massinissa's support from his old allies in Rome, and despite the fact that fighting Massinissa could lead to a confrontation with Rome. 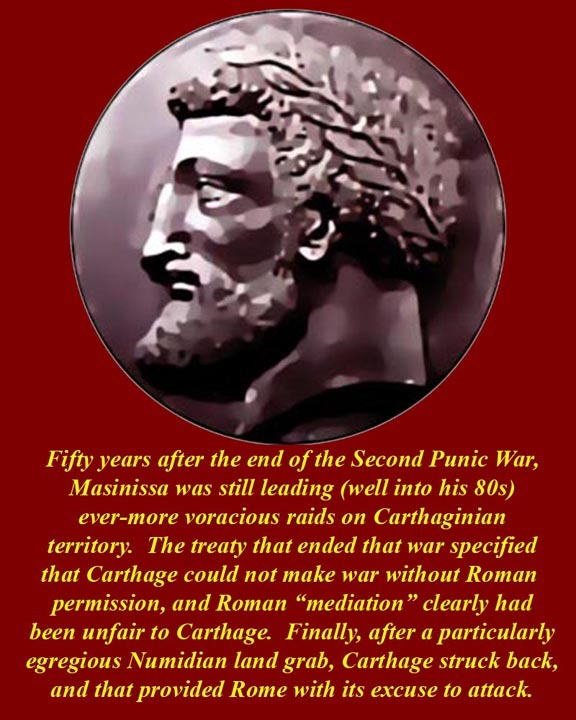 A second Carthaginian faction was willing to let Massinissa be active at the fringes and to do whatever it took to appease Rome; this was the old Carthaginian faction that wanted peace to allow them to pursue their commercial aspirations. A third and much smaller faction actually advocated making the Numidian Massinissa, who had good contacts in Rome, the leader of Carthage. Both in Rome and in Carthage, political alliances were always shifting and either Roman faction and either of the first two Carthaginian factions might hold power at any given time. Cato's faction in Rome sent fact-finding commissions to Carthage that returned saying Carthage was re-arming. The Scipio faction said it was not. 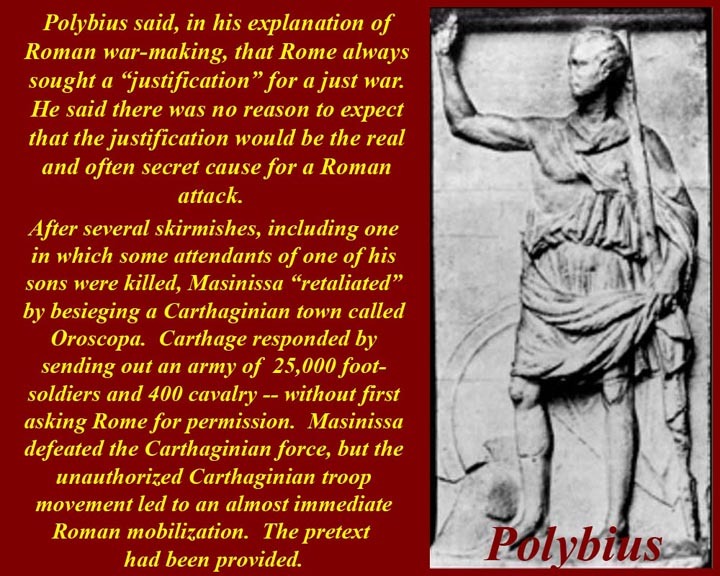 Polybius, in his history (as reported by Appian) said that Rome was seeking a pretext for war and that Carthage had provided one by retaliating after a Massinissa raid. But the Rome war faction faction said that Carthage had retaliated with a force of 25,000 infantry and 400 Cavalry, and, therefore, clearly was not "disarmed". 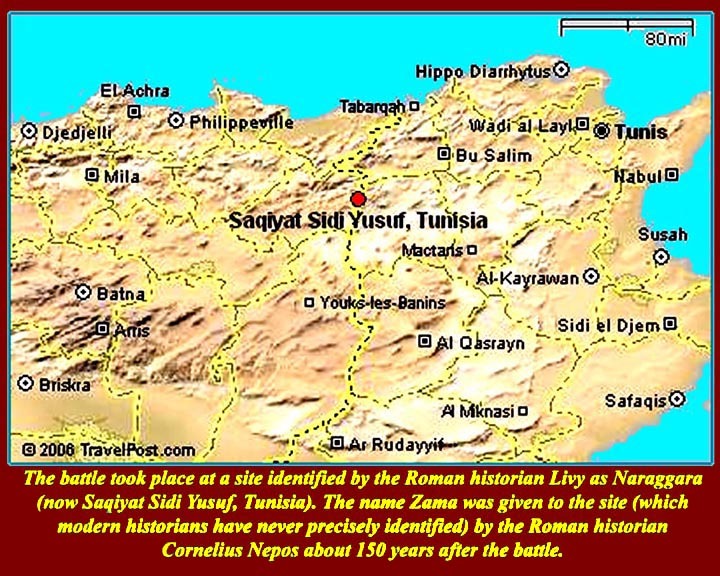 Massinissa repelled the Carthaginian counterattack and Rome mobilized and declared that Carthage had resumed the war. 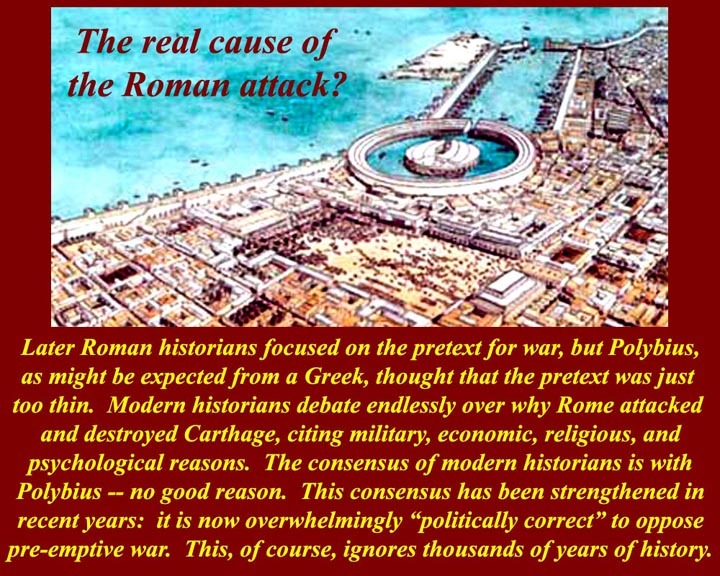 Modern historians have pretty much sided with Polybius and said the pretext for the Third Punic War was entirely too thin -- preemptive war is very unpopular these days. 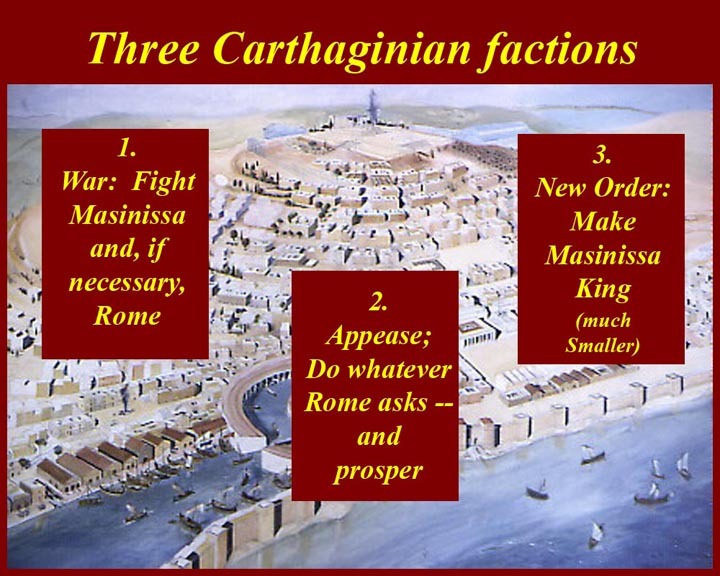 After Rome declared that a state of war again existed, the Carthaginian peace faction took over, executed the leaders of the attack on Massinissa, and asked Rome what Carthage could do to restore peace. Rome demanded hostages from all the main Carthaginian families and total disarmament of Carthage. Carthage agreed. Two hundred Carthaginians were sent to Rome, and Carthage surrendered "all" of its arms. 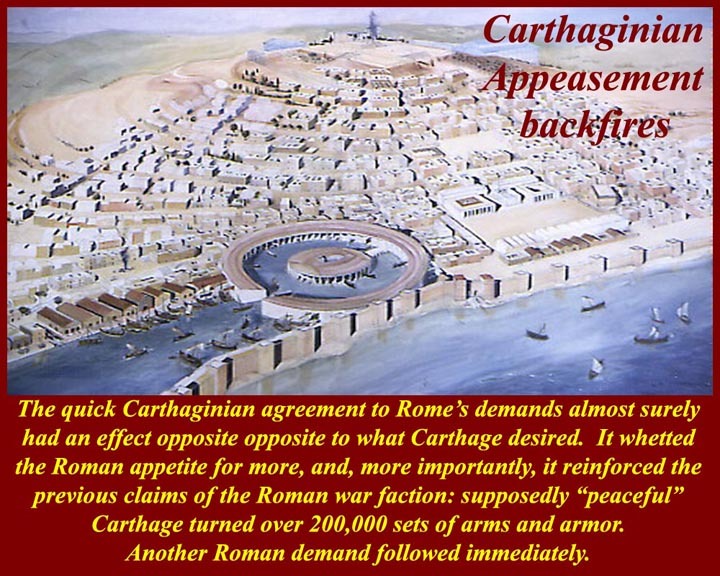 The appeasement backfired when Carthage turned over enough arms and armor to equip an army of 200,000 mercenaries. The Roman peace faction was aghast; Carthage clearly had re-armed in contravention to the treaty. And Rome's appetite had been whetted. 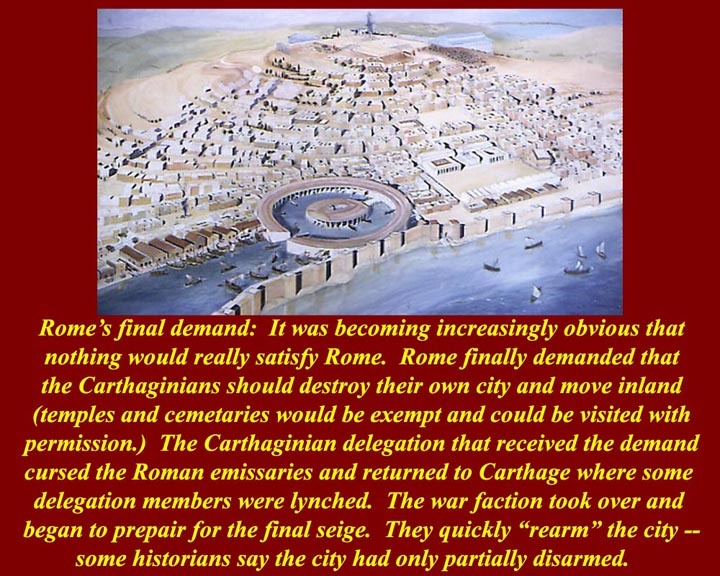 Rome made a another "final" demand: the Carthaginians had to destroy their own city and move inland to where they would no longer be a threat. When the Carthaginian envoys returned to Carthage with this demand, they were lynched and the war party took over again. They quickly "rearmed" to defend the city. "Rearmed" is in parentheses because it was obvious that the gear they had turned over to Rome was only part of what they had. Rome launched an expeditionary force and the Third Punic War began in earnest in North Africa. Fifty years had elapsed since the last war with Carthage. 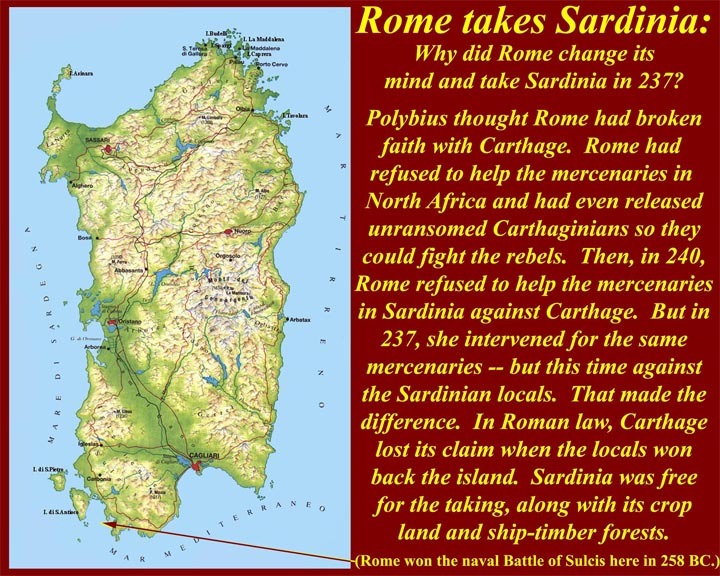 The first Roman commanders in this war were inexperienced political generals, and they lost consistently against the Carthaginians, who had at least some experience fighting Massinissa. The only exception -- the only experienced general -- for the Romans was the Younger Scipio, who had led a successful campaign in Spain. 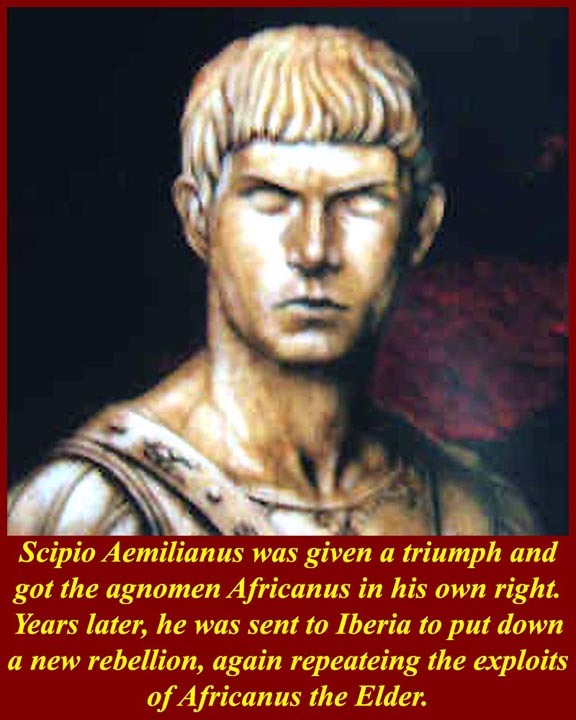 But Scipio was too young to be elected Consul and so could not be given command. Scipio went back to Rome and campaigned for the Consular office even though under age. The Senate and the People of Rome (SPQR) suspended the age requirement and sent Scipio back to Carthage as Commander-in-Chief. Although Scipio had not wanted the war with Carthage, he had been put in charge of its destruction. Scipio made short work of Carthage. He established a tight naval blockade, and working from a headquarters in Utica (Utica, ever willing to stab Carthage in the back in the hope of gaining commercial advantage in the post-war), he attacked from the north side of the city. At one crucial moment, the defenders of the city broke down the wall of the military harbor and sallied forth against the naval blockade with dozens of hastily assembled military ships. The attempt to break the blockade failed, but it proved, once again, that Carthage had really had not disarmed. It also left a hole in the seaside defenses. Scipio's army then poured into the city from the its sea side and began to work its way up to the citadel at the top of the Bursa hill. The fighting in the streets was vicious -- Scipio quickly leveled a three block wide path to the citadel, killing everyone in his path. The citadel was surrounded with about 50,000 citizens and defenders inside (along with a few Roman defectors from years past). After it was set afire, the defenders surrendered. 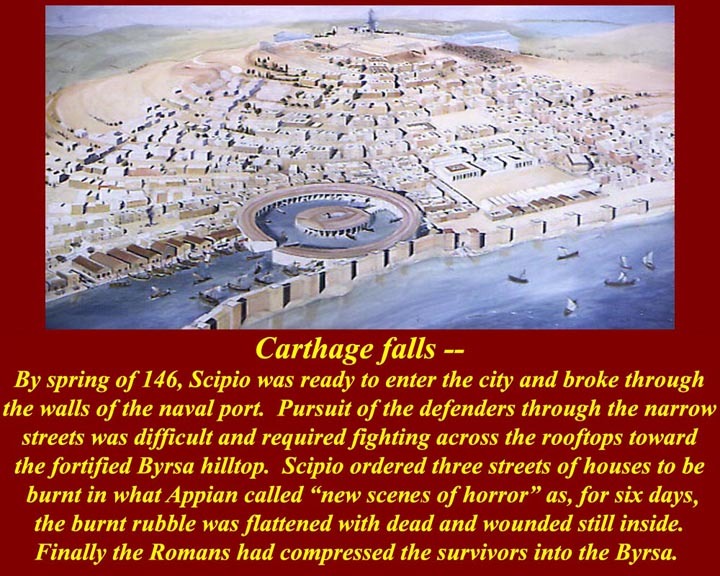 Appian, on the authority of Polybius (who was in the city with Scipio) said that of the 250 to 500 thousand people who lived in Carthage at the start of the attack, only those who surrendered from the citadel survived, and they survived as slaves. The Roman defectors, Polybius said, all burned up in the fire at the big temple at the center of the citadel. 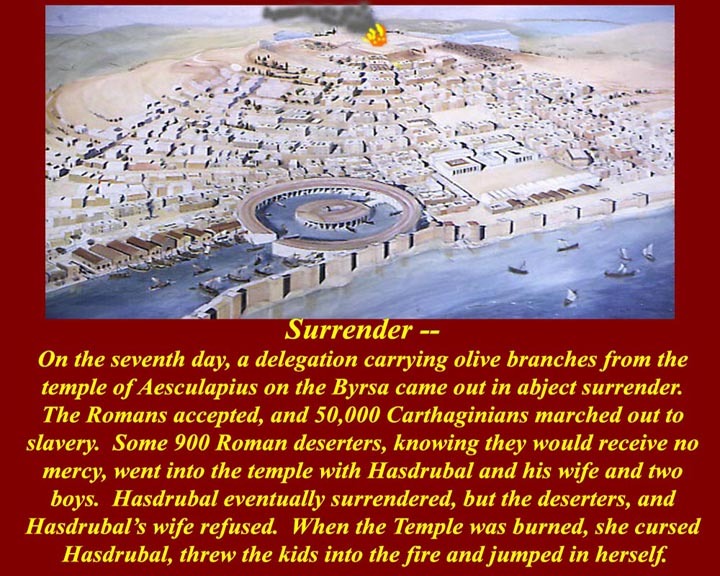 The city commander, Polybius said, surrendered, but his wife took her kids and jumped with them into the fire. 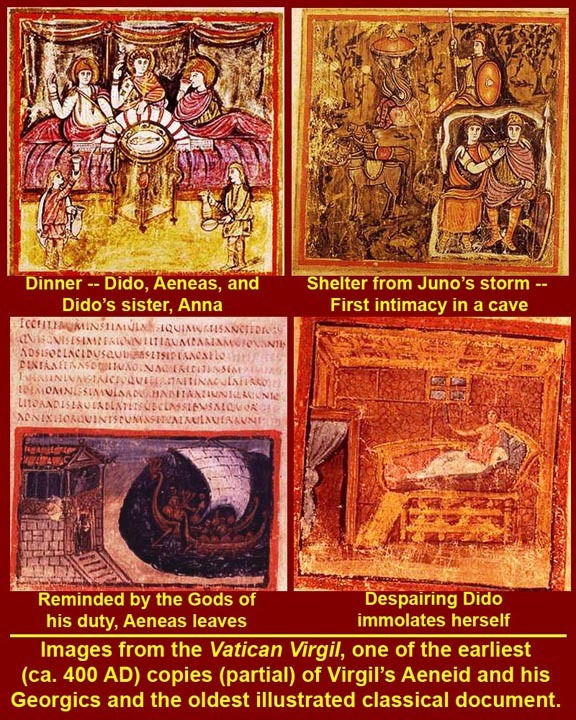 The wife and kids story sounds like embroidery to reflect the story of the death of Dido/Elissa in the Aeneas myth, but who knows? Suicide martyrs are quite common in Semitic history/mythology. 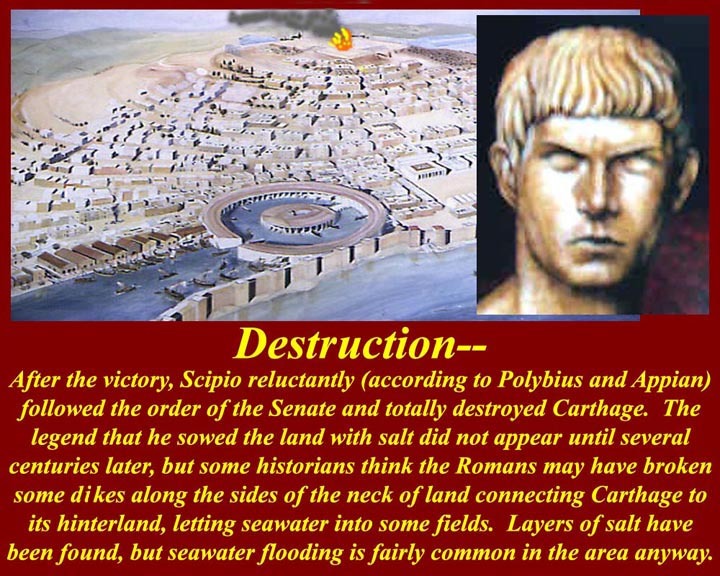 Scipio followed the orders of the Roman Senate and leveled what was left of Carthage. Scipio, according to Polybius, wept at the destruction of Carthage but not out of pity for Carthage. Polybius said he asked Scipio why he wept, and Scipio replied that he foresaw a similar fate for Rome at some time in the future. The new metropolis of North Africa would be Utica -- at least until the time of Augustus, who established Carthage anew and shifted back to his new Carthage the headquarters of the Roman governorate. Rome ruled north Africa, eventually all the way across to Egypt, until the Vandal conquest from 429 to 439 AD. Count Belesarius took it back for Byzantine "Rome" in the middle of the next century and it stayed in Byzantine hands until the Arab Muslim invasions in the middle of the 7th century. 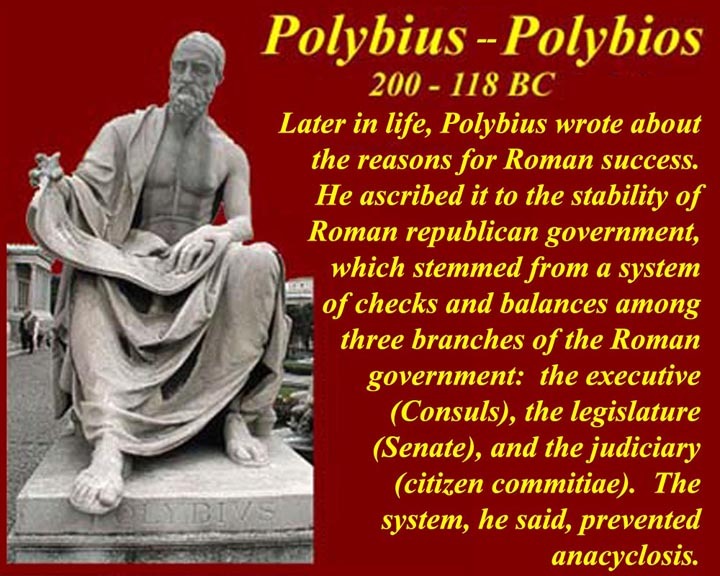 Polybius lived on until 118 BC, and was a protege of the Scipios until he died. He wrote most of his histories late in life, which including the books on the Punic Wars and on the political organization of Rome and Carthage. His histories might have had a pro-Scipio slant, but in the text he did not hesitate to show where he thought the Scipios were mistaken. He was writing for the Greek audience in his Attic homeland, and he was trying to show how Rome succeeded in expanding throughout the Mediterranean -- and why Greek resistance to Roman expansion was futile. When the Greeks rebelled anyway, he was sent, as a Roman diplomat diplomat, to restore Roman peace. His efforts were successful, and monuments still stand in Greece attesting to how Polybius was the savior of his country. Of course those monuments were set up by the Greeks who agreed to the Roman conquest. Some of those monuments that lasted into the 20th century were destroyed by Greek Communists during and immediately after World War 2.